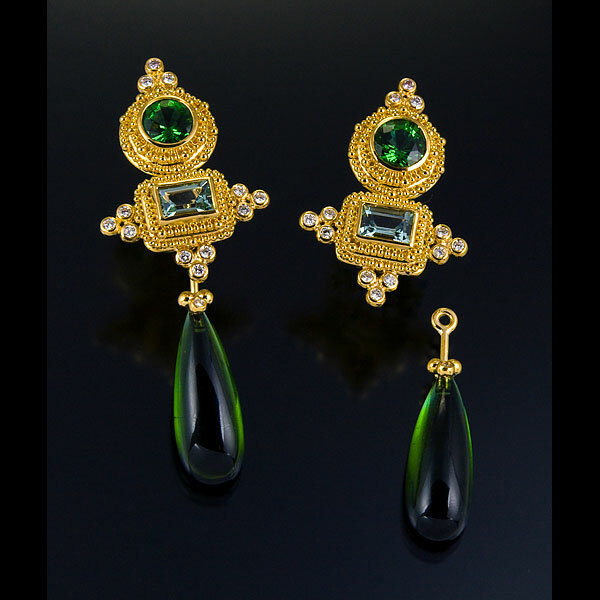 Earrings are set with Tsavorite Garnets and Diamonds in granulated 22kt yellow gold with 18kt yellow gold posts. 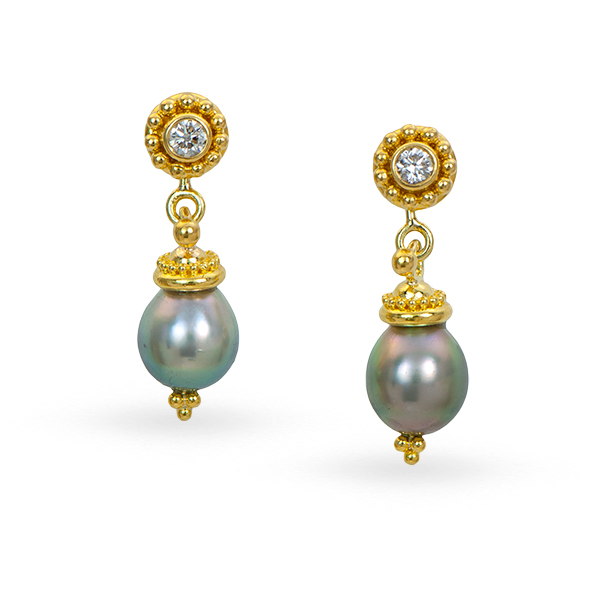 Keshi Pearl and Diamond earrings in 18kt white gold have removable drops set with Yellow Beryls (9.10tcw) and Blue Zircons (.60tcw) in granulated 22kt yellow gold with oxidized sterling silver elements. 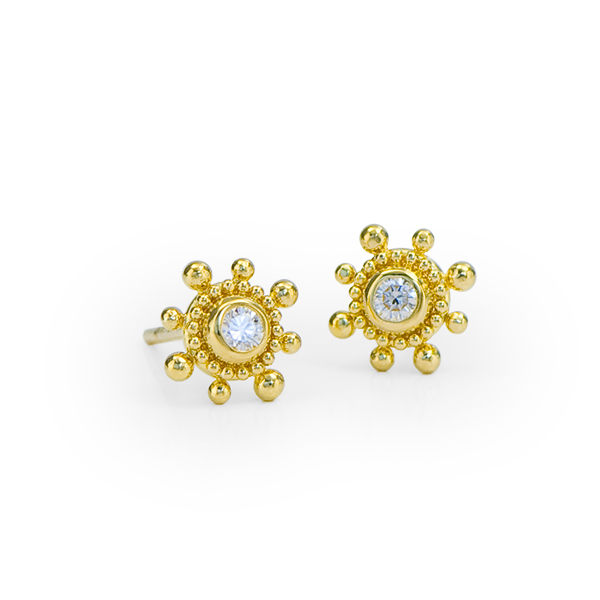 Stud earrings are set with Diamonds in granulated 22kt yellow gold with 18kt yellow gold posts. 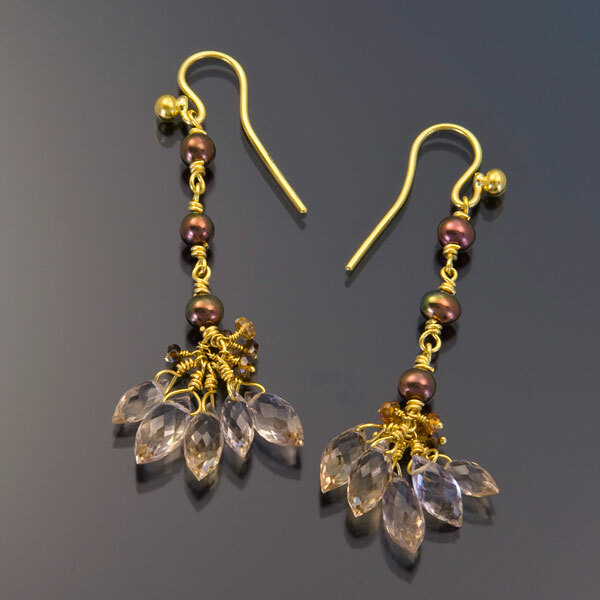 Removable drops are Oregon Sunstones set in granulated 22kt yellow gold. 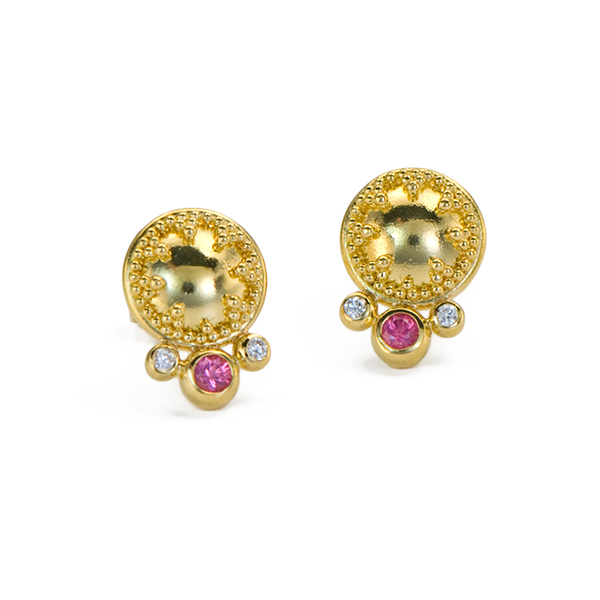 Stud earrings are set with Diamonds in granulated 22kt yellow gold with 18kt yellow gold posts. 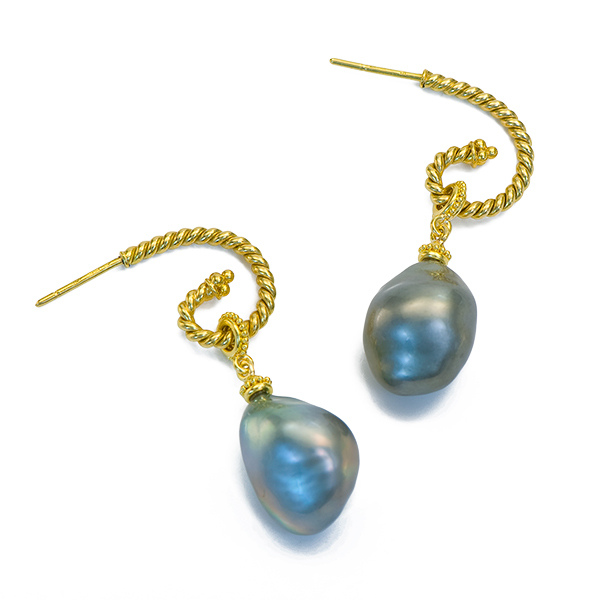 Removable drops are Grey Tahitian Pearls in granulated 22kt gold. 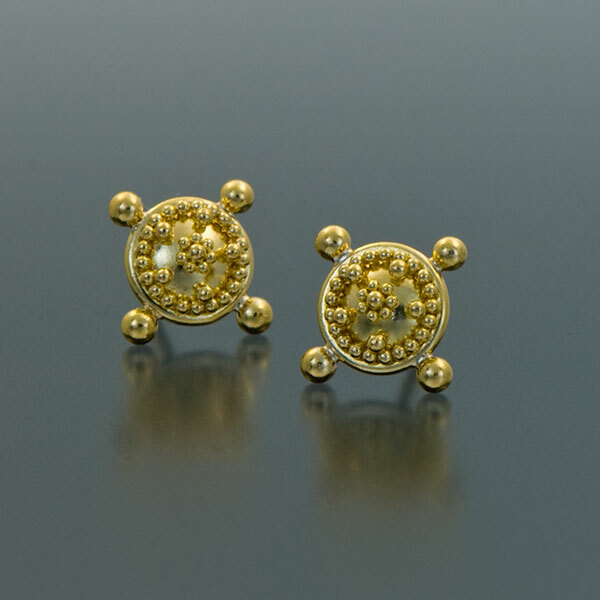 Earrings have White Diamonds (.14tcw) and Cognac Diamonds (.13tcw) set in granulated 22kt yellow gold with forged and oxidized sterling silver elements and 18kt yellow gold posts, 1 1/8″ L x 3/8″ W.
Earrings have 22kt yellow gold granules arranged in a tiny flower pattern with 18kt yellow gold posts, 1/8″ in diameter. 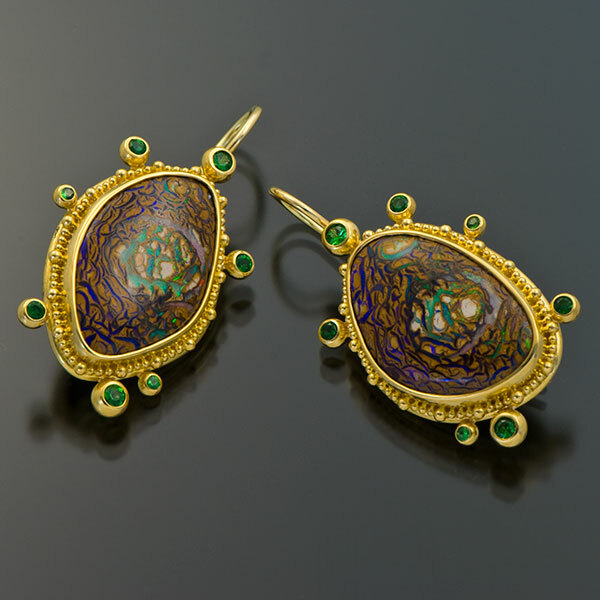 Earrings are set with Tsavorite Garnets (.14tcw) in granulated 22kt yellow gold with 18kt yellow gold posts, 3/8″ in diameter. 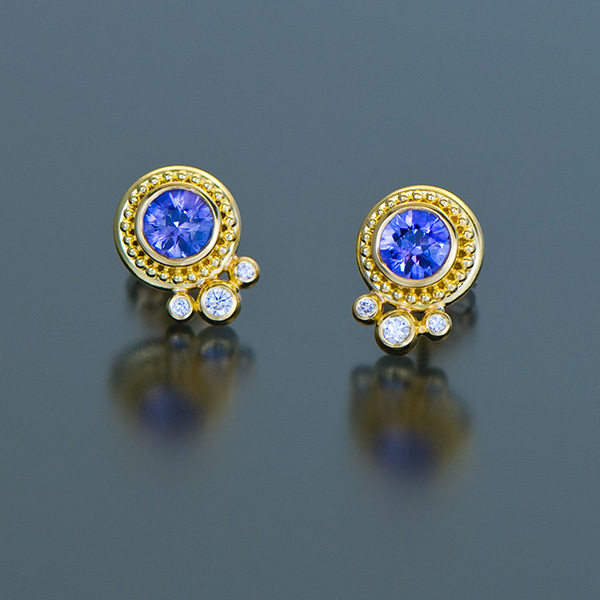 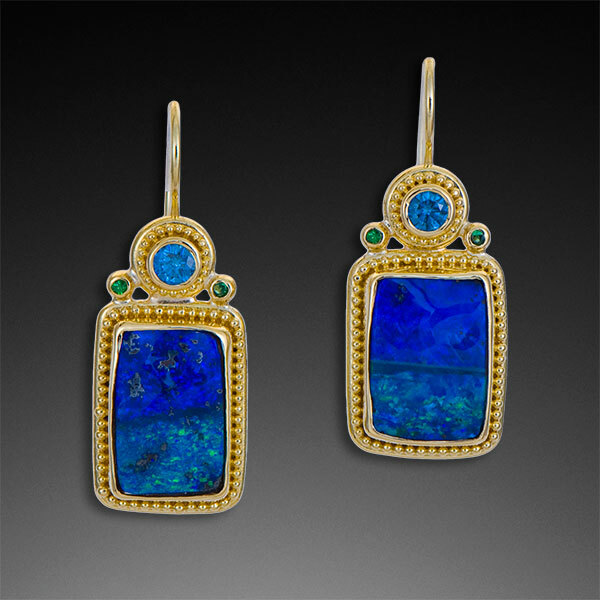 Earrings are set with Blue Zircons (.20tcw) in granulated 22kt yellow gold with 18kt yellow gold posts, 3/8″ in diameter. 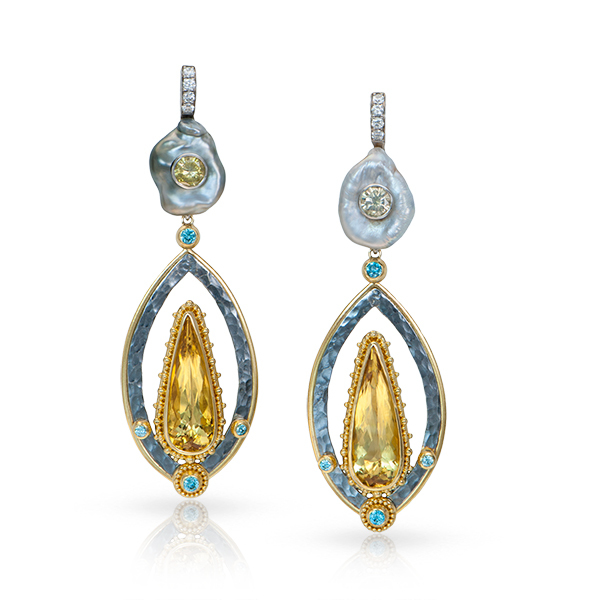 Earrings are set with Teal Diamonds (.34tcw) and White Diamonds (.14tcw) in granulated 22kt yellow gold with Hachita, NM Turquoise drops (23.85tcw, 39x8mm) and 18kt yellow gold posts, 2.25″ L.
Earrings are set with Lilac Garnets (.28tcw) and Tabasco Geodes (28x17mm) in granulated 22kt yellow gold with 18kt yellow gold posts, 1.675″ L.
Stud earrings are set with Blue Sapphires (.16tcw) in granulated 22kt yellow gold and 18kt yellow gold posts, 3/8″ diameter. 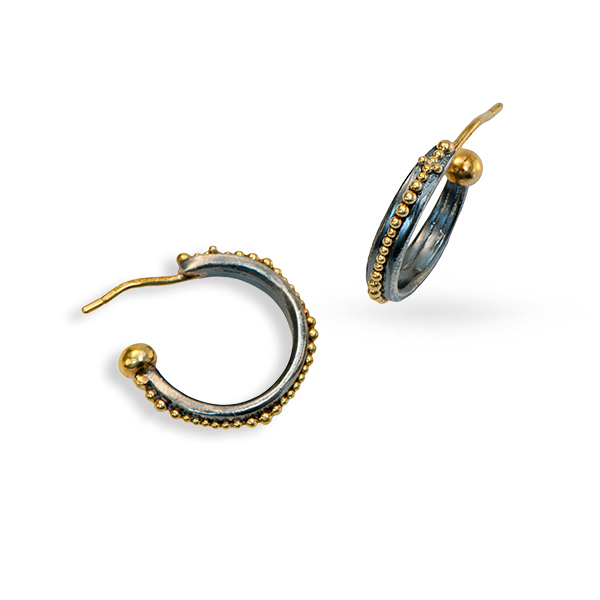 Hoop Earrings are in the Twist/Swirl style in oxidized sterling silver with 22kt yellow gold detail and 18kt yellow gold posts. 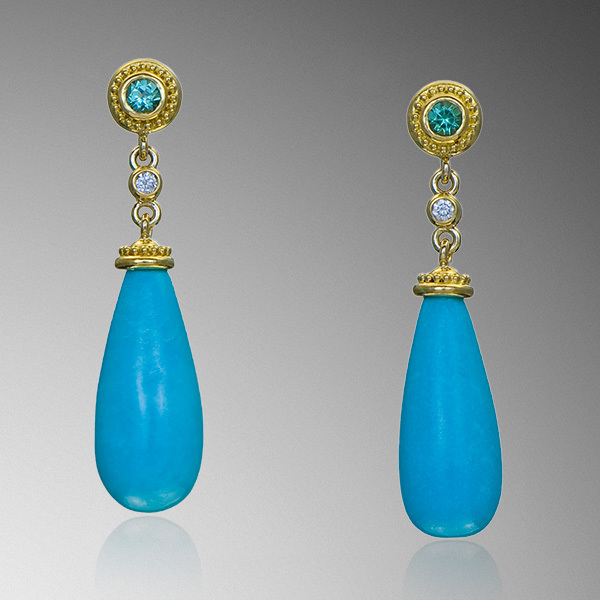 Drops have Sleeping Beauty Turquoise briolettes (13×6.6mm, 6.86tcw) in granulated 22kt yellow gold. 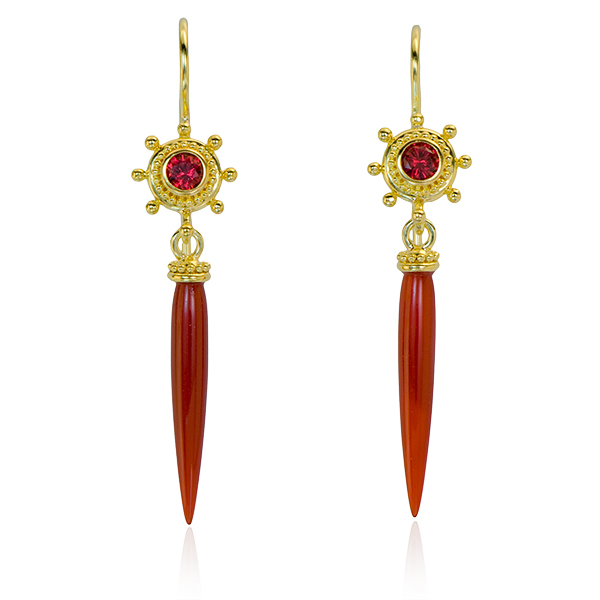 1.75″ L x .25″ W x .5″ D.
Earrings are set with Red Spinels (.40tcw) and Carnelian spikes (4x24mm, 3.97tcw) in granulated 22kt yellow gold with 18kt yellow gold french hooks, 1 7/8″ L x 3/8″ W.
Earrings are set with Pink Sapphires (.38tcw), Tahitian Silver Round Pearls (8.7mm) and Tahitian Silver Baroque Pearls (18x14mm) in granulated 22kt yellow gold with 18kt yellow gold posts, 2″ L x 1/2″ W x 1/2″ D.
Earrings are set with Tsavorite Garnets (.32tcw), Diamonds (.24tcw) and Blue Zircons (.20tcw) on Australian Yowah Boulder Opals (26.2×19.7mm, 36.6tcw) in granulated 22kt yellow gold with 18kt yellow gold french hooks, 1 1/4″ W x 1″ L.
Earrings are set with Diamonds (.14tcw) in granulated 22kt yellow gold with 18kt yellow gold posts, 3/8″ in diameter. 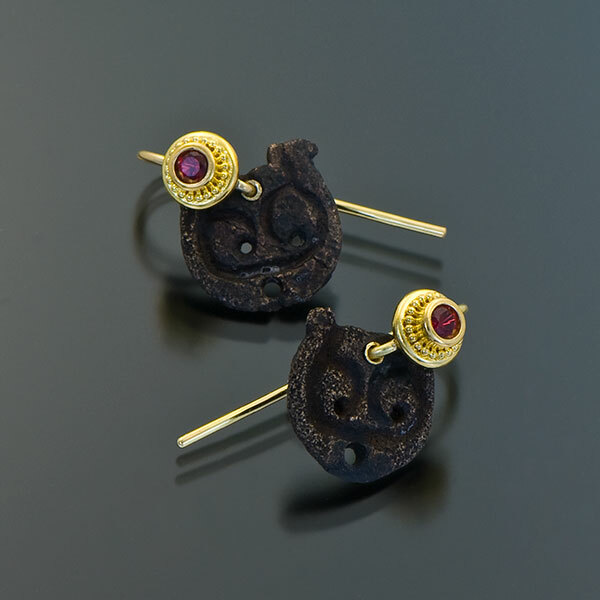 Earrings are set with Garnets, Spinels and Diamonds in granulated 22kt yellow gold on textured and oxidized sterling silver earrings. 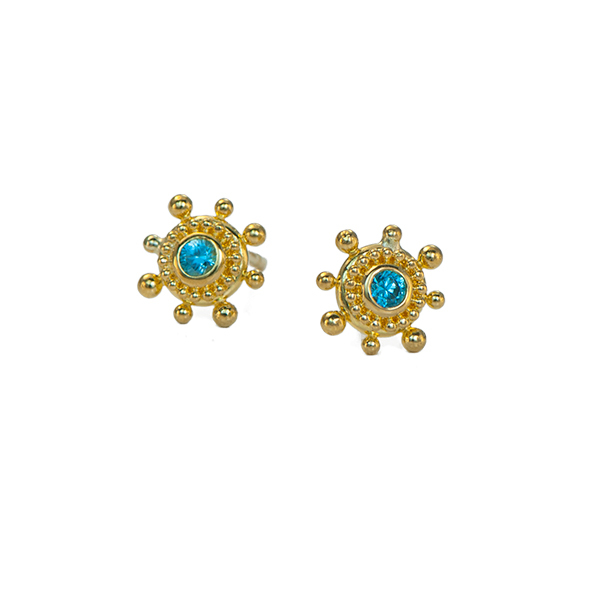 The button tops are 5/8″ in diameter and the total length with bottom drop is 2 1/4″. 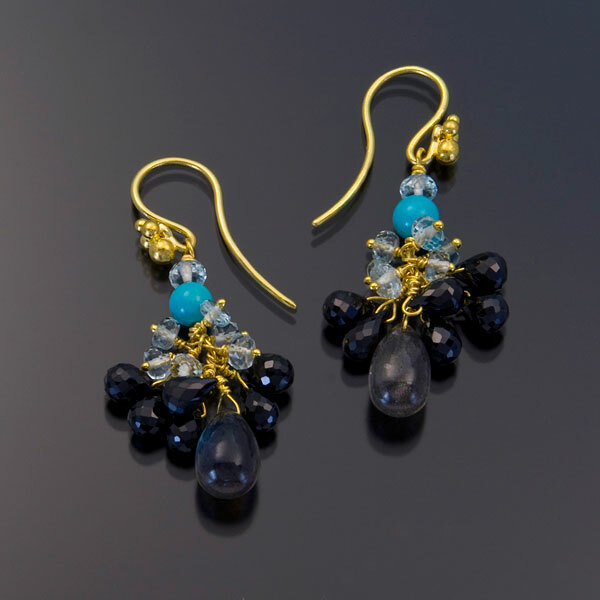 Earrings are set with Black Spinel briolettes (15x9mm, 22.62tcw) and Diamonds (.14tcw) in granulated 22kt yellow gold with 18kt yellow gold french hooks, 1.125″ L x .25″ W.
Earrings are set with Sleeping Beauty Turquoise smooth briolettes, Mint Green Tourmalines and Diamonds in granulated 22kt yellow gold with 18kt yellow gold posts. 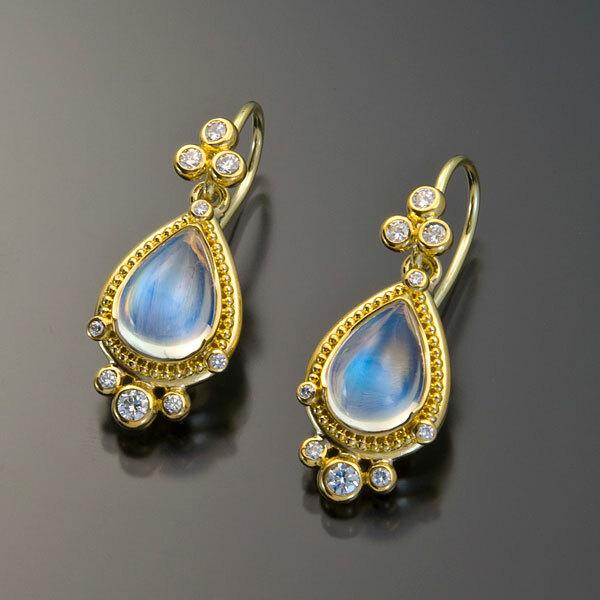 Earrings are set with Rainbow Moonstones (2.25tcw) and Diamonds (.12tcw) in granulated 22kt yellow gold with 18kt yellow gold french hooks. 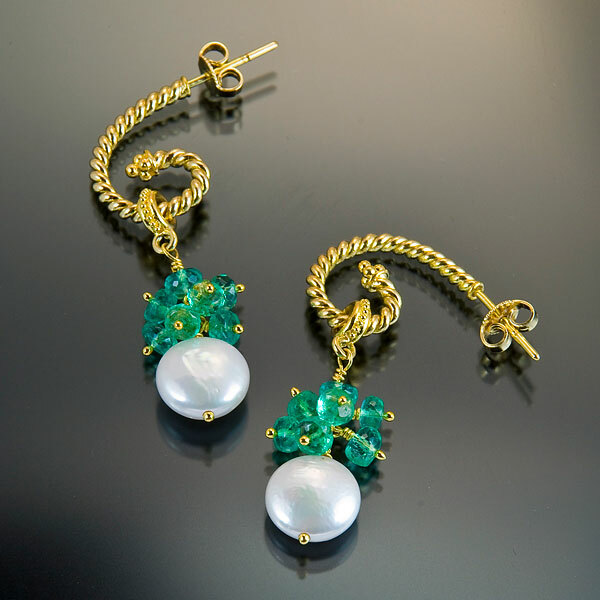 Earrings are set with Chrysoprase briolettes (16.75tcw, 16.9×8.8mm), Mint Green Tourmalines (.24tcw) and Diamonds (.16tcw) in granulated 22kt yellow gold with 18kt yellow gold french hooks, 2″L x 3/8″W. 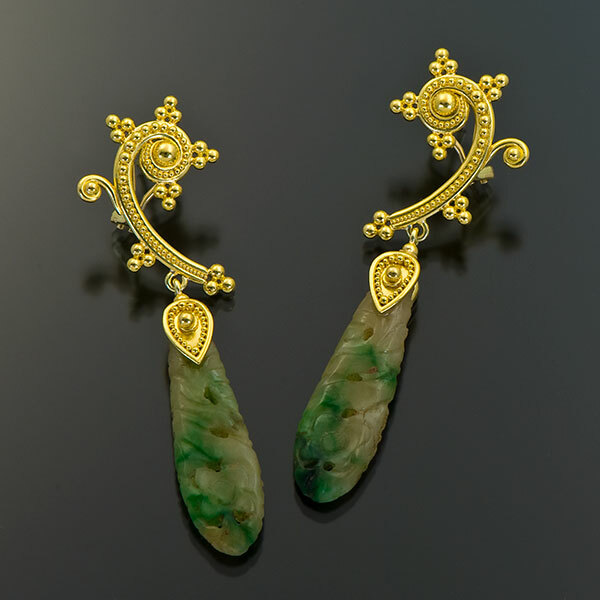 Earrings are set with Australian Boulder Opals, Tsavorite Garnets and Diamonds in granulated 22kt yellow gold with 18kt yellow gold french hooks. 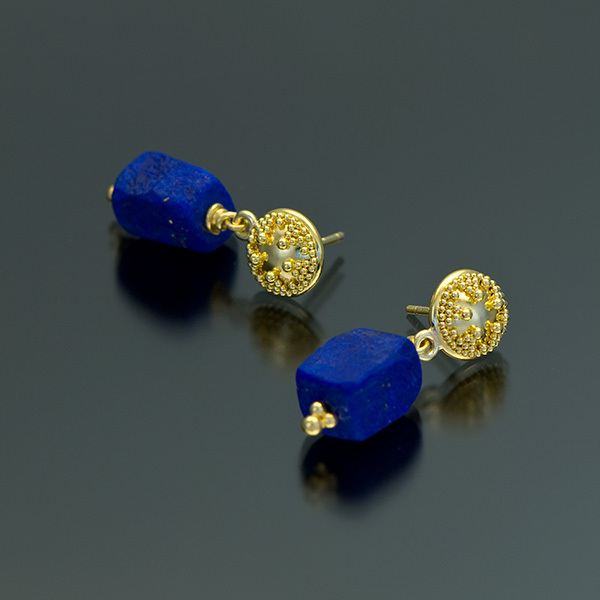 Button earrings are in granulated 22kt yellow gold with 18kt yellow gold posts and Lapis surface bead drops. 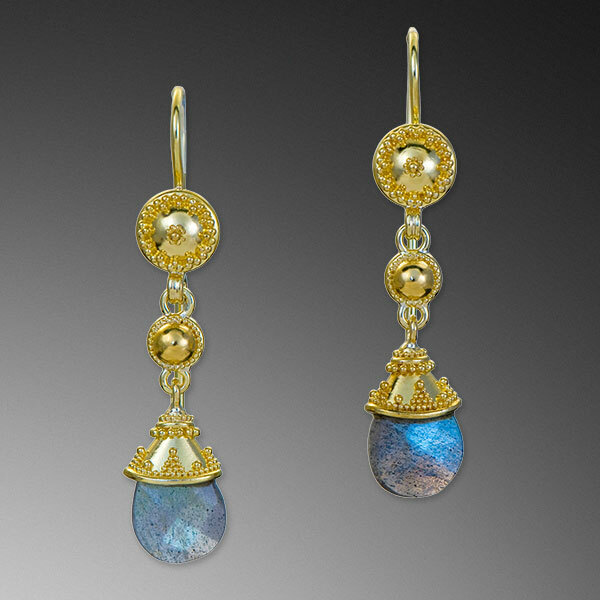 Button earrings are in granulated 22kt yellow gold with 18kt yellow gold posts and Kyanite bead fringe, 1 3/8″ L x 3/8″ W.
Stud earrings are set with Rubies (.90ctw) in granulated 22kt yellow gold with 18kt yellow gold posts. 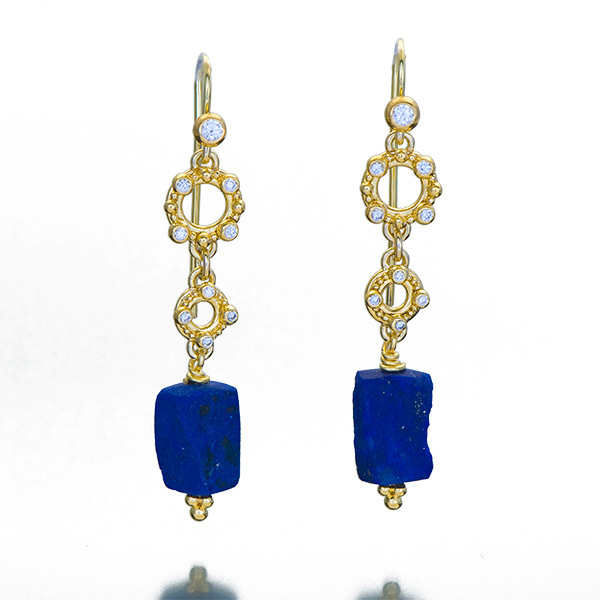 Earrings are set with Diamonds (.34tcw) in granulated 22kt yellow gold with Lapis surface beads and 18kt yellow gold french hooks, 2″L. 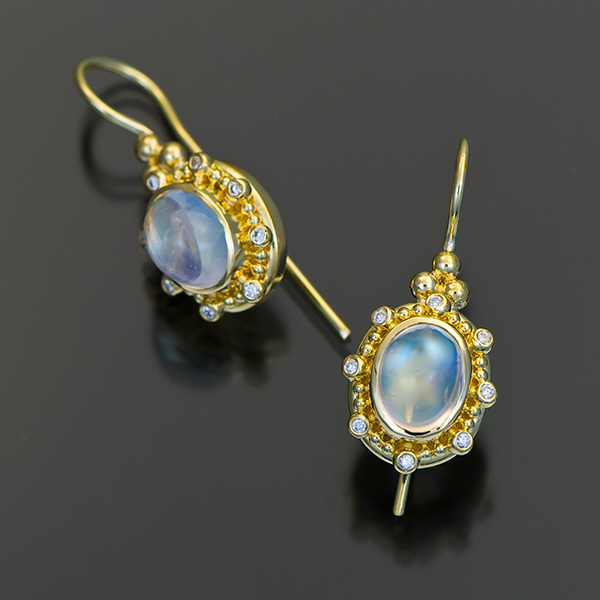 Earrings are set with Rainbow Moonstones (9x7mm, 4.68tcw) and Diamonds (.16tcw) in granulated 22kt yellow gold with 18kt yellow gold french hooks, 1″L x 3/8″W. 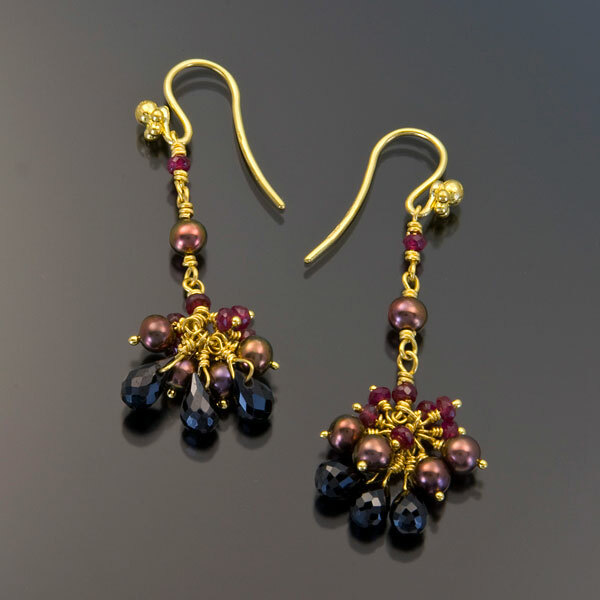 Earrings are set with Red Spinels (.38tcw) and Silver Tahitian Baroque Pearls (12x16mm) in granulated 22kt yellow gold with Red Spinel Beads and 18kt yellow gold french hooks. 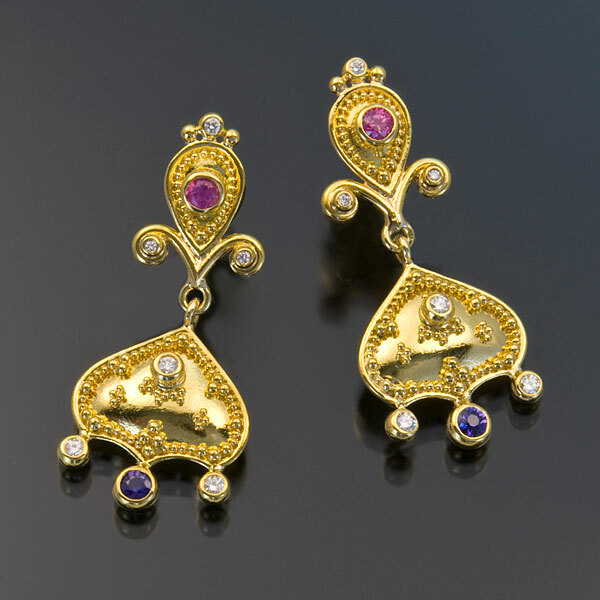 Earrings are set with Purple Sapphires (5.0mm, .99tcw) and Diamonds (.10tcw) in granulated 22kt yellow gold with 18kt yellow gold posts, 3/8″ W x 1/2″ L.
Earrings are set with Pink Spinels (.18tcw) in granulated 22kt yellow gold with 18kt yellow gold posts, 3/4″ in length. 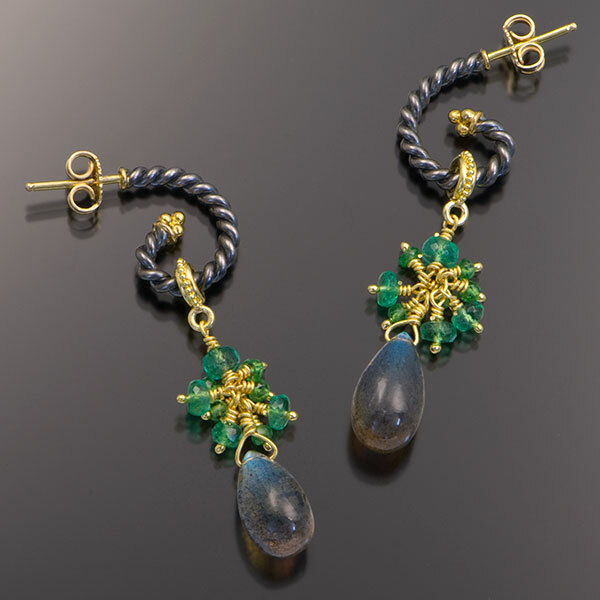 Earrings have Opalized Petrified Wood tear drops (20x28mm, 39.4tcw) set with Teal Diamonds (.05tcw) and Tsavorite Garnets (.06tcw) in granulated 22kt yellow gold with 18kt yellow gold french hooks, 1 1/2″ L x 7/8″ W.
Earrings are set with Lapis (9×15.5mm, 7.58tcw) and Diamonds (.22tcw) in granulated 22kt yellow gold with 18kt yellow gold french hooks, 1 1/2″ L x 1/2″ W.
Earrings are set with Rainbow Moonstones (7.23tcw) in granulated 22kt yellow gold with 18kt yellow gold posts, 3/4″ in diameter. 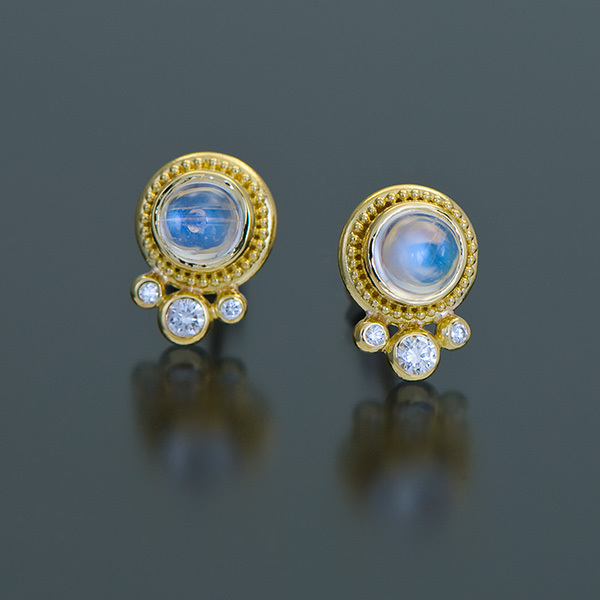 Earrings are set with Rainbow Moonstones (6mm, 1.98tcw) and Diamonds (.06tcw) in granulated 22kt yellow gold with 18kt yellow gold posts. 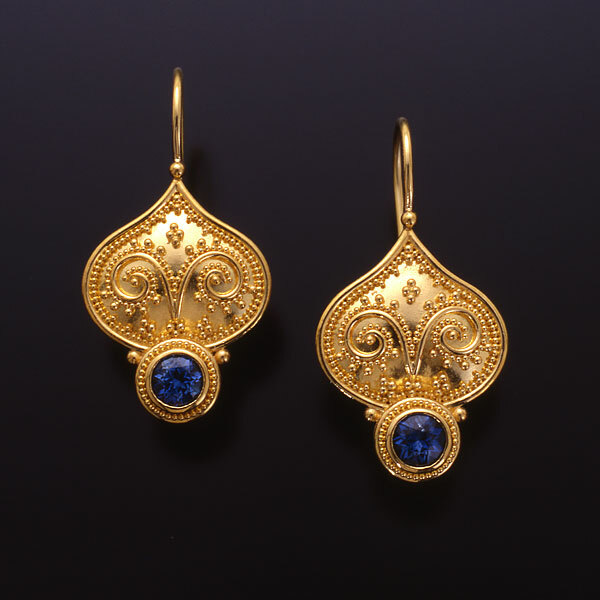 Earrings are an elongated half-hoop in granulated 22kt yellow gold with a Lapis natural surface bead drop and 18kt yellow gold posts, 2″ L x .375″ W.
Hoop Earrings are in the Twist/Swirl style in oxidized sterling silver with 22kt yellow gold detail and 18kt yellow gold posts. 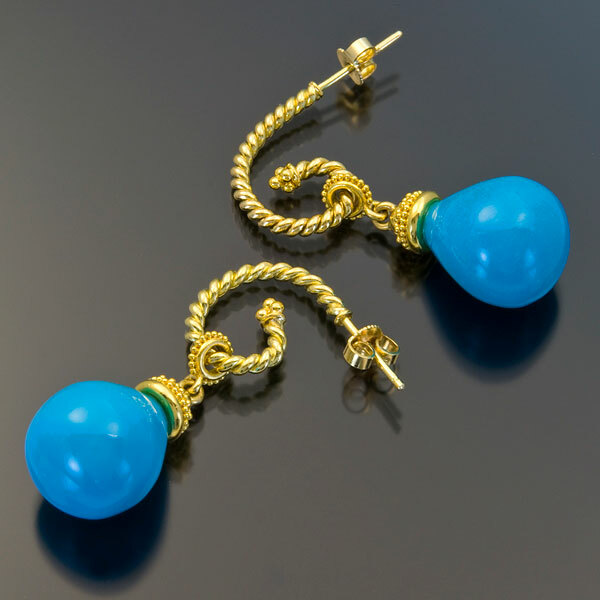 Drops have Mexican Fire Opal faceted beads in granulated 22kt yellow gold, 2.25″ L x .5″ W.
Earrings are set with Rose-cut Rainbow Moonstones (8mm, 4.36tcw) and Sleeping Beauty Turquoise briolettes (8x22mm, 18.44tcw) in granulated 22kt yellow gold with 18kt yellow gold french hooks, 2″ L x .5″ W.
Hoop earrings are in granulated 22kt yellow gold with 18kt yellow gold posts. 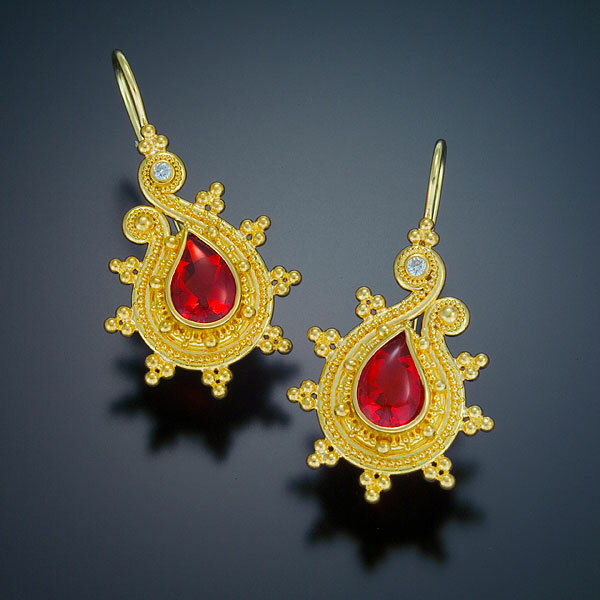 Removeable drops are also in granulated 22kt yellow gold. 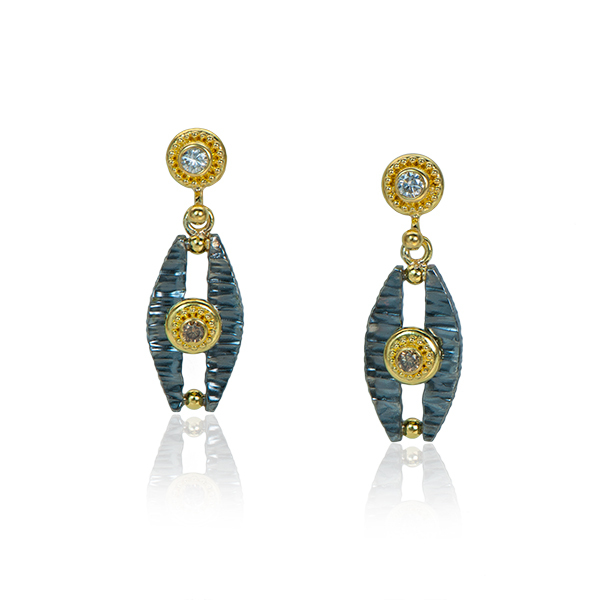 Hoop Earrings are in the Twist/Swirl style in oxidized sterling silver with 22kt yellow gold detail and 18kt yellow gold posts. 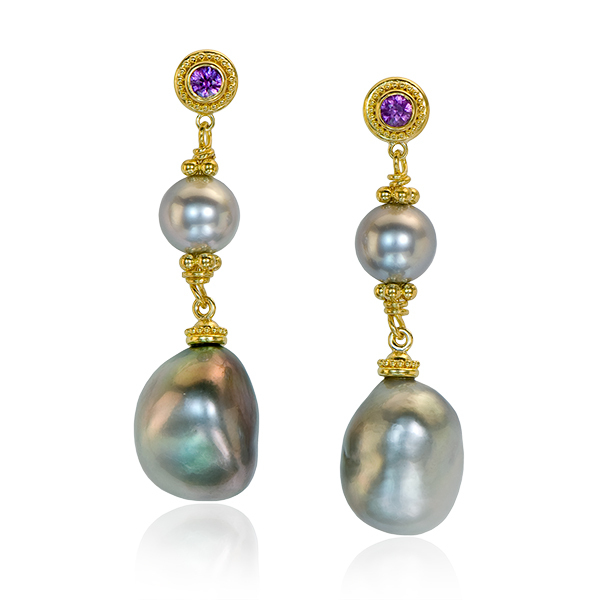 Drops have Black Freshwater Petal Pearls, Amethyst beads and Rhodolite Garnet beads in granulated 22kt yellow gold. 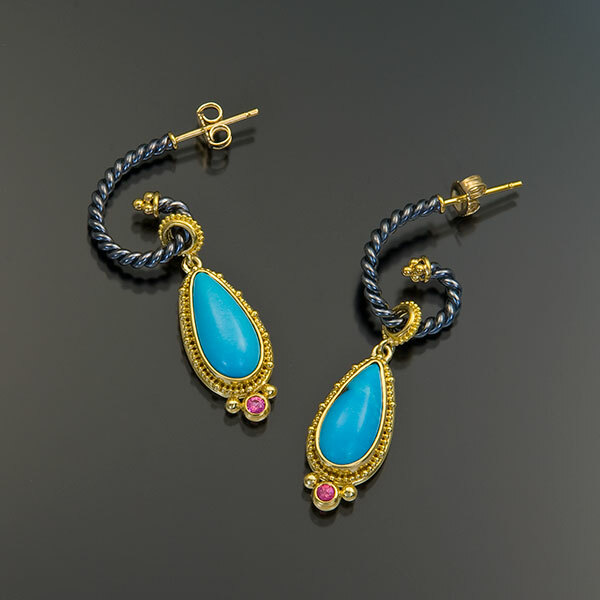 1.75″ L x .75″ W x .75″ D.
Hoop Earrings are in the Twist/Swirl style in oxidized sterling silver with 22kt yellow gold detail and 18kt yellow gold posts. 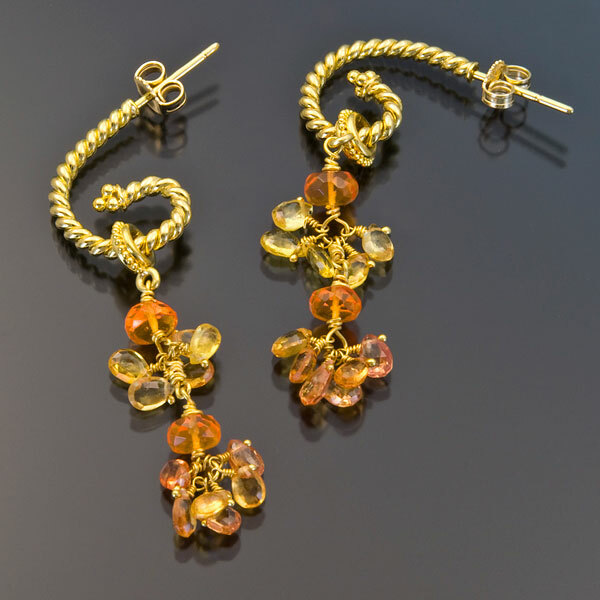 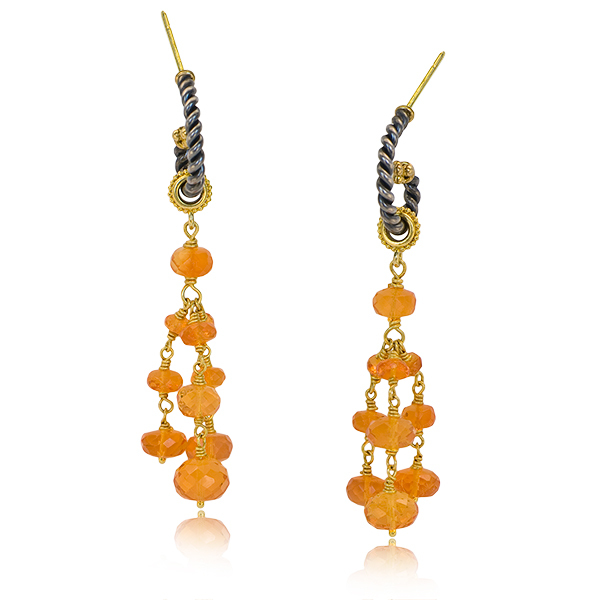 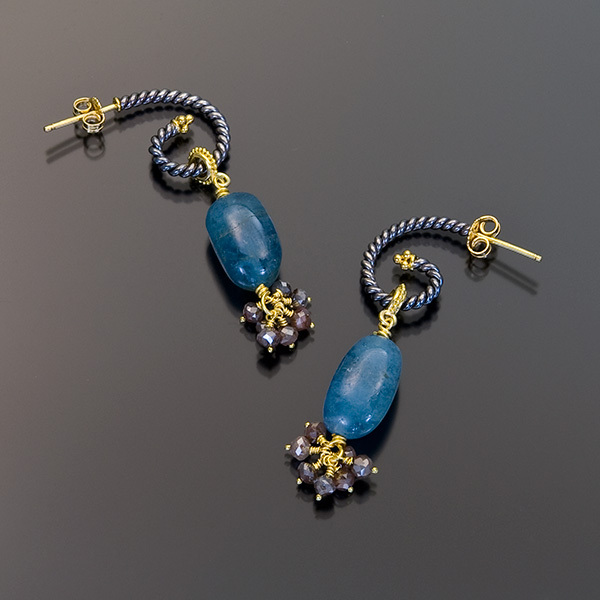 Drops have Denim Aquamarine Beads and Cognac Diamond Faceted Beads in granulated 22kt yellow gold. 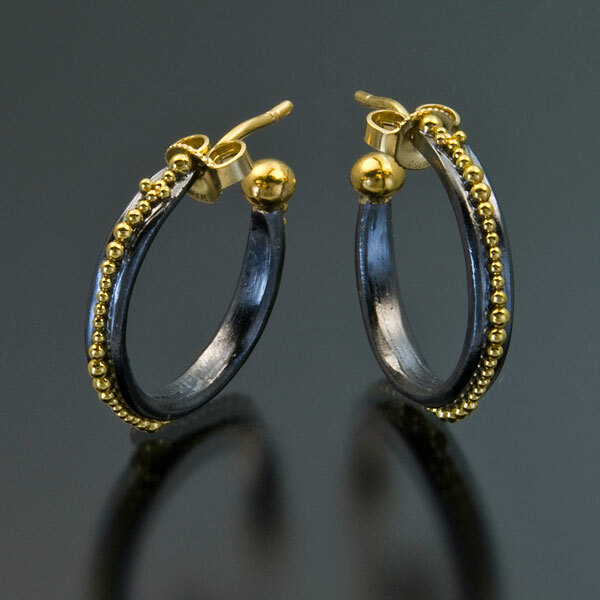 2″ L x .5″ W x .5″ D.
Hoop Earrings are in the Twist/Swirl style in oxidized sterling silver with 22kt yellow gold detail and 18kt yellow gold posts. 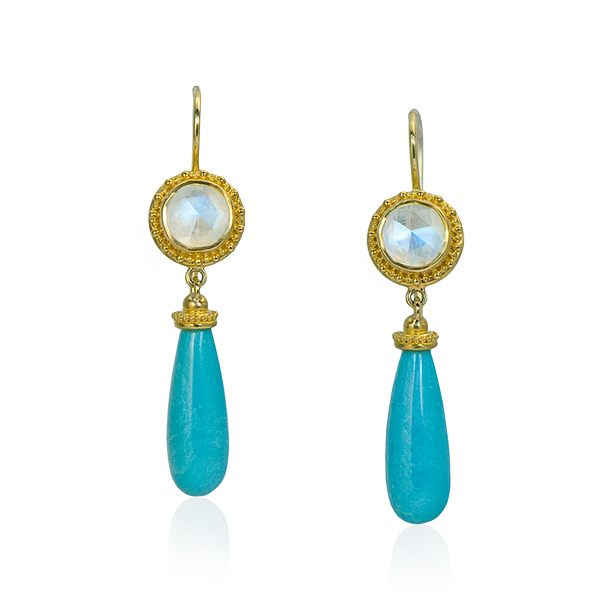 Drops have Prehnite Briolettes and Aquamarine Faceted Beads in granulated 22kt yellow gold. 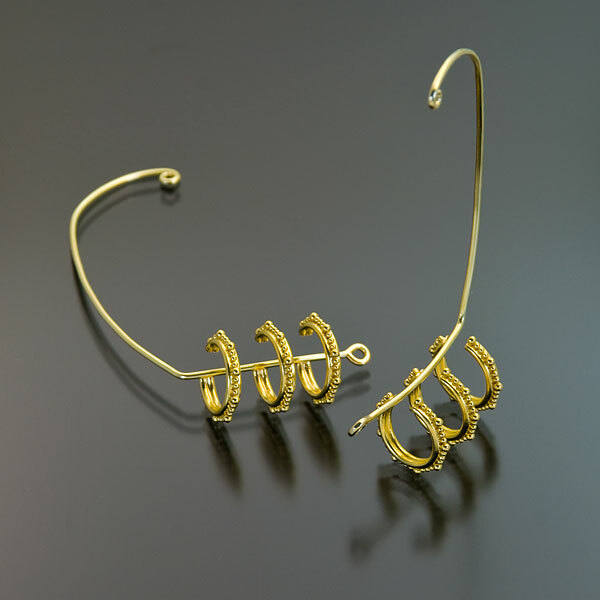 2″ L x .5″ W x .5″ D.
Hoop Earrings are in the Twist/Swirl style in oxidized sterling silver with 22kt yellow gold detail and 18kt yellow gold posts. 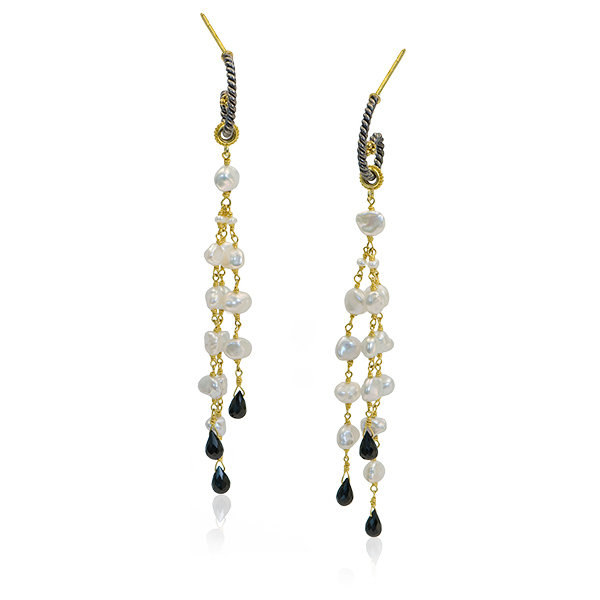 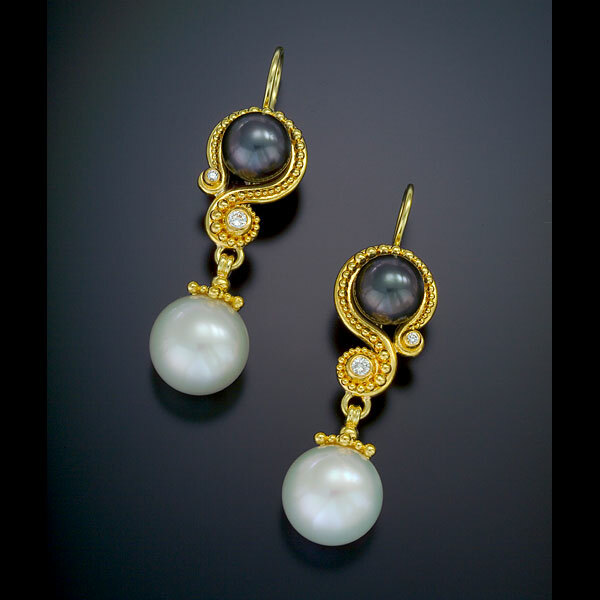 Drops have White Keshi Freshwater Pearls and Black Spinel Briolettes in granulated 22kt yellow gold. 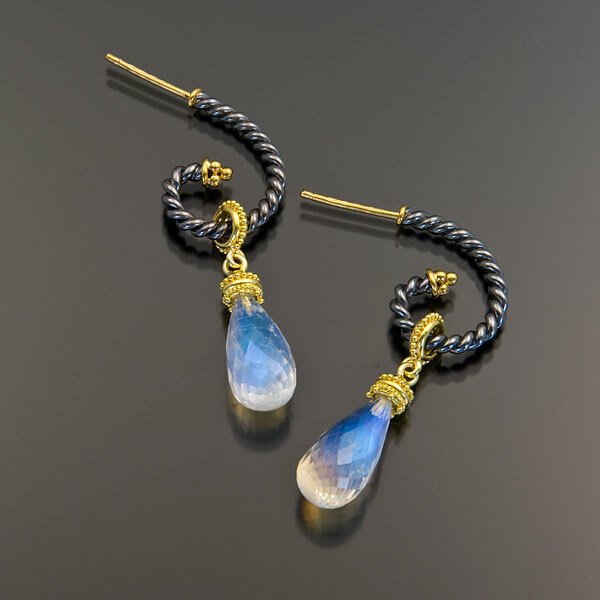 4″ L x .5″ W x .5″ D.
Earrings are set with Labradorite briolettes in granulated 22kt yellow gold with 18kt yellow gold french hooks. 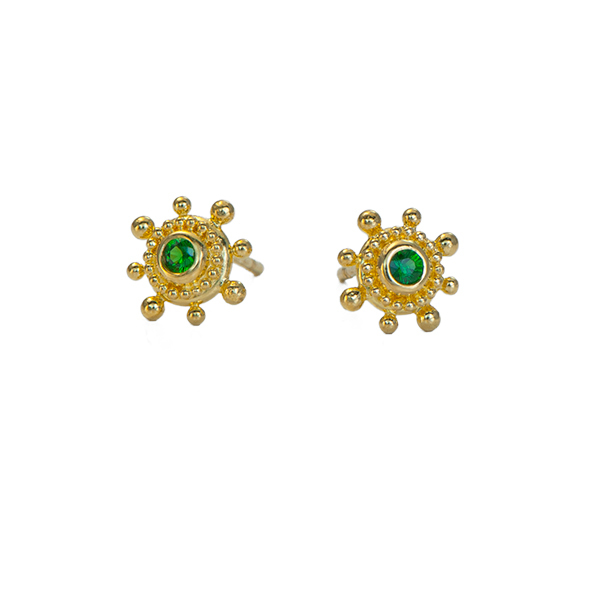 Custom earring jackets for client’s Emerald stud earrings. 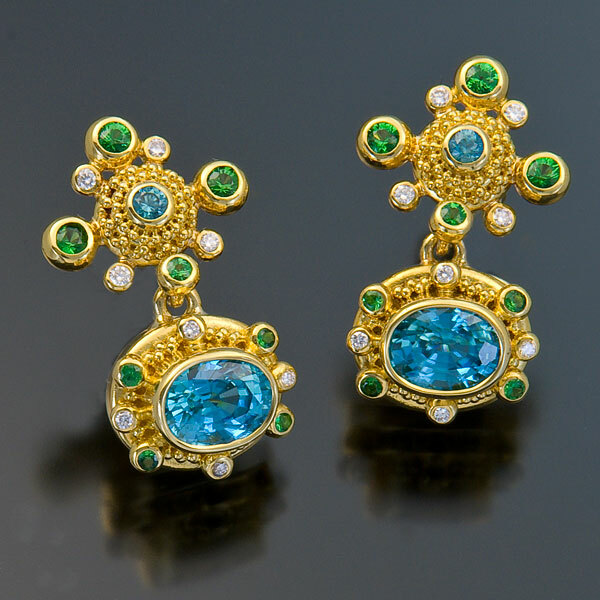 Jackets are in granulated 22kt yellow gold with Demantoid Garnets and Prasiolite briolettes. 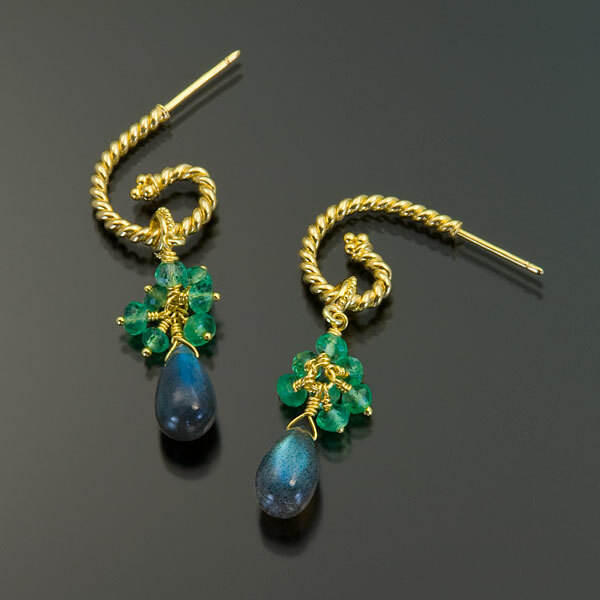 Earrings are set with Australian Boulder Opals (15×9.5mm, 11.11tcw), Teal Diamonds (.34tcw) and Tsavorite Garnets (.08tcw) in granulated 22kt yellow gold with 18kt yellow gold french hooks, 1 1/2″L x 1/2″W. 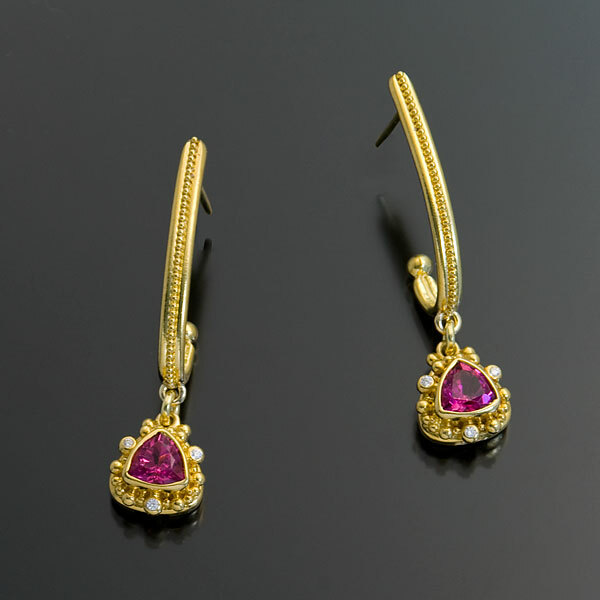 Earrings are set with Tahitian Keshi Pearls (10x12mm), Alexandrites (.38tcw) and Rhodolite Garnet faceted beads in granulated 22kt yellow gold with 18kt yellow gold french hooks, 2.5″ L x 1/2″ W.
Earrings are set with Moonstone briolettes (8.7×17.7mm, 16.45tcw) and Diamonds (.14tcw) in granulated 22kt yellow gold with 18kt french hooks. 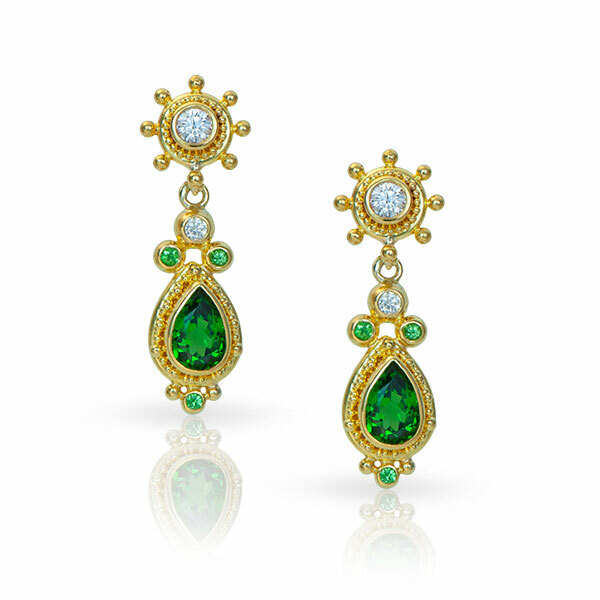 Earrings are set with Tsavorite Garnets (.14tcw) and Diamonds (.06tcw) in granulated 22kt yellow gold with 18kt yellow gold posts, 3/8″ in diameter. 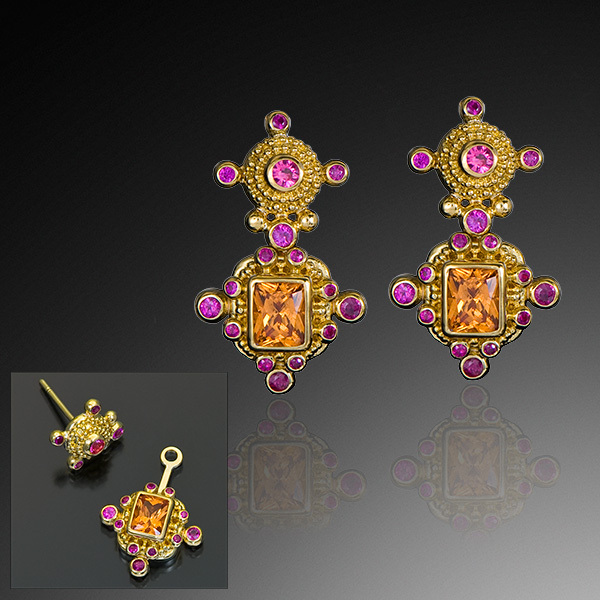 Earrings are set with Tanzanite flat briolettes (18x13mm, 20.82cts), Pink Sapphires (.43tcw) and Pink Spinels (.18tcw) in granulated 22kt yellow gold with oxidized sterling silver frames and 18kt yellow gold posts. 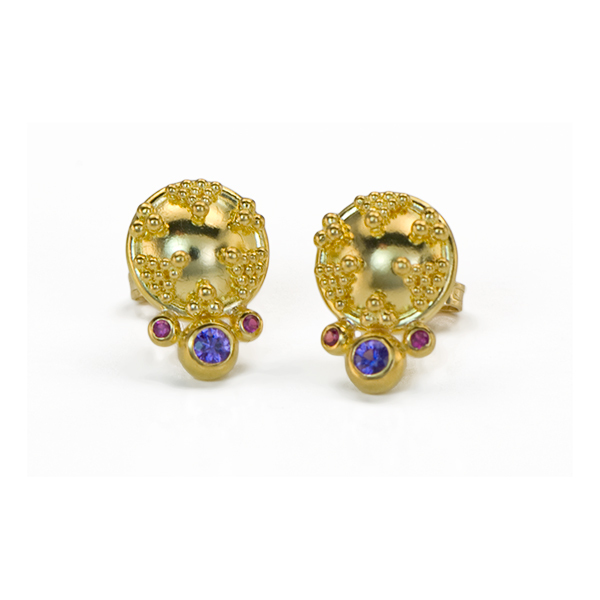 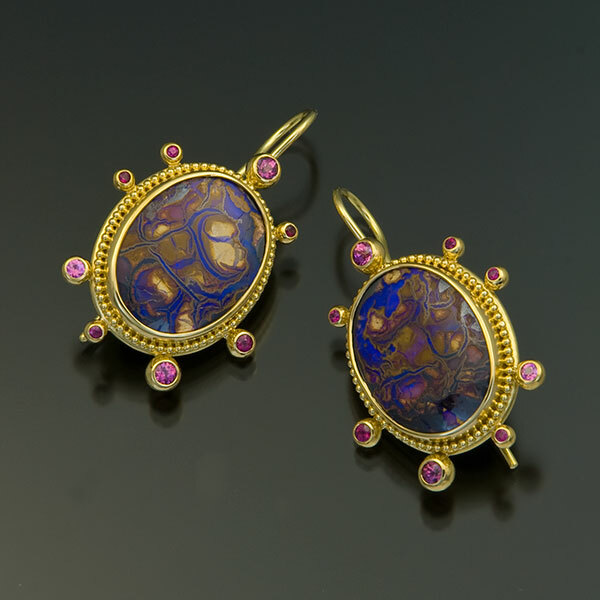 Earrings are set with Purple Sapphires (.14tcw) and Pink Sapphires (.06tcw) in granulated 22kt yellow gold button earrings with 18kt yellow gold posts, 3/8″ in diameter. 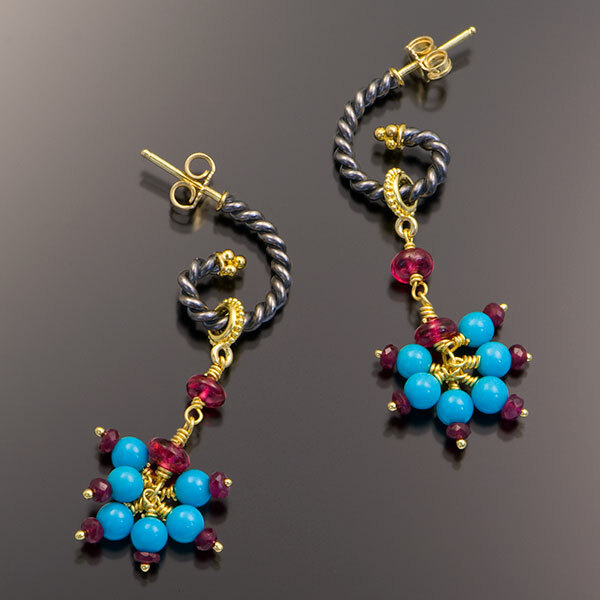 Drops have Sleeping Beauty Turquoise beads, Ruby beads and Red Spinel beads in granulated 22kt yellow gold. 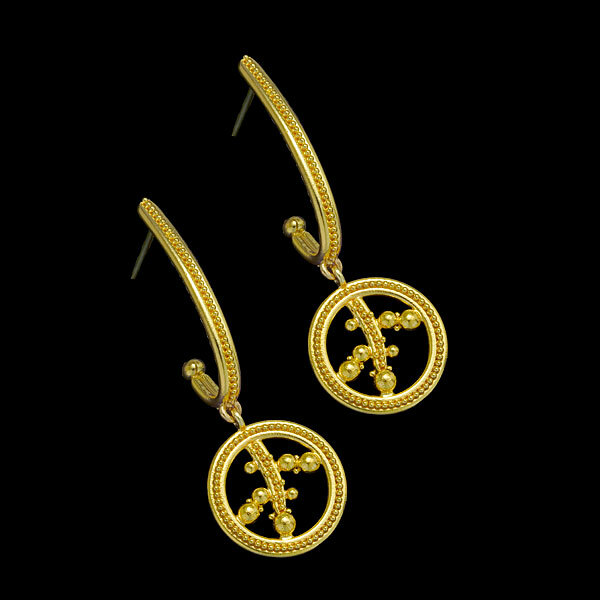 Hoops are in the Twist/Swirl style in oxidized sterling silver with 22kt yellow gold detail and 18kt yellow gold posts, 1 3/4″ total length. 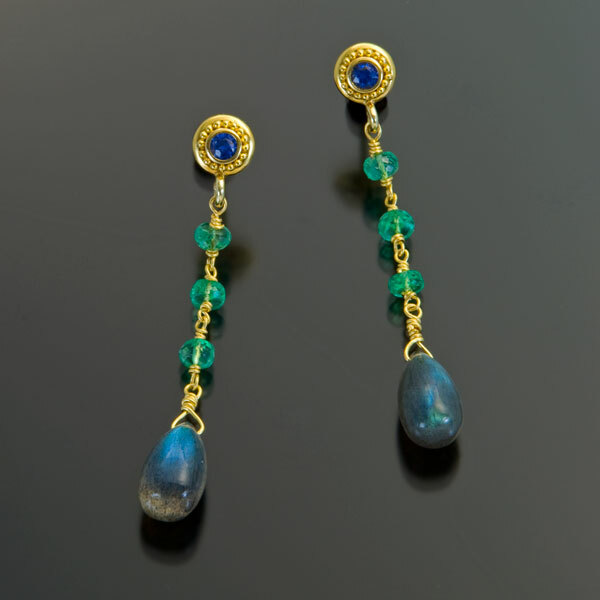 Drops have Labradorite briolettes, Emerald beads and Tsavorite Garnet beads in granulated 22kt yellow gold. 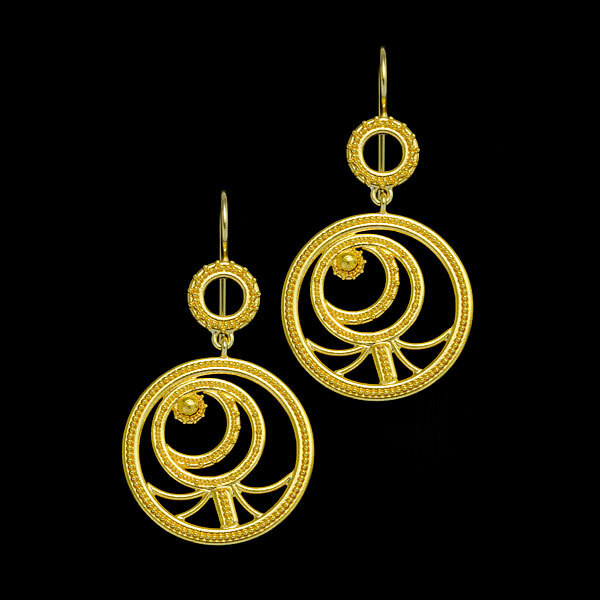 Hoops are in the Twist/Swirl style in oxidized sterling silver with 22kt yellow gold detail and 18kt yellow gold posts, 1 7/8″ total length. 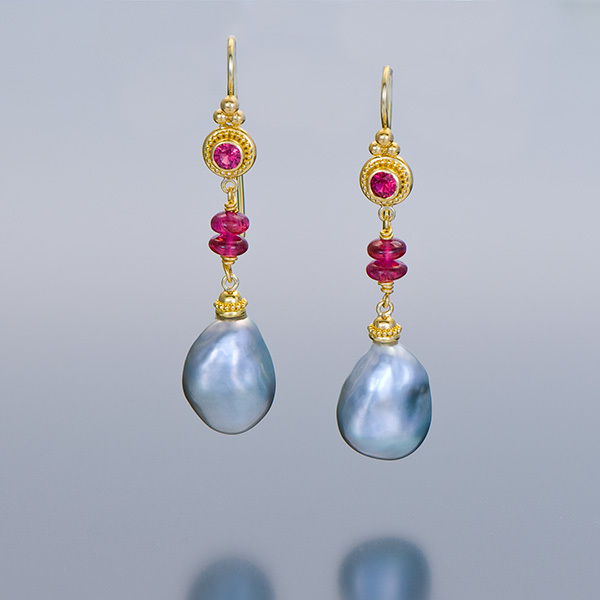 Drops have Black Freshwater Petal Pearls, Tanzanite beads, Pink Tourmaline beads and Rhodolite Garnet beads in granulated 22kt yellow gold. 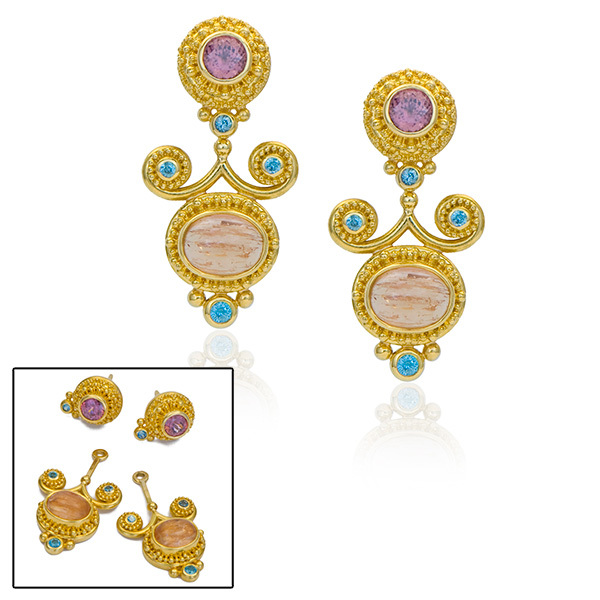 Hoops are in the Twist/Swirl style in 18kt yellow gold with 22kt yellow gold detail, 1 1/2″ total length. 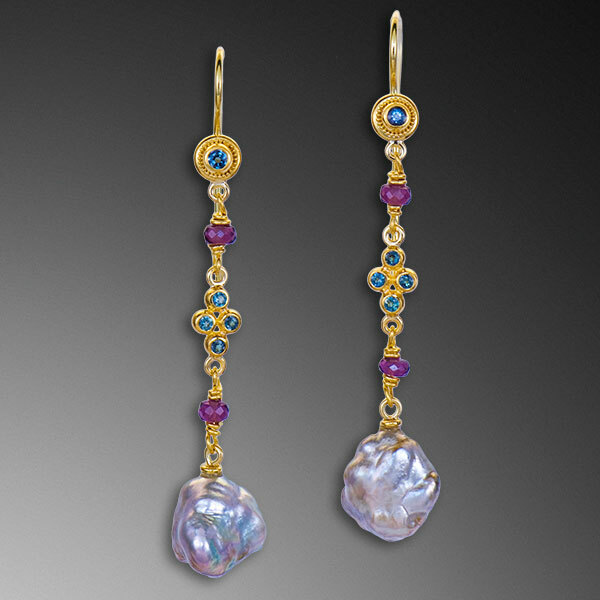 Drops have White Freshwater Petal Pearls, Emerald beads and Apatite beads in granulated 22kt yellow gold. 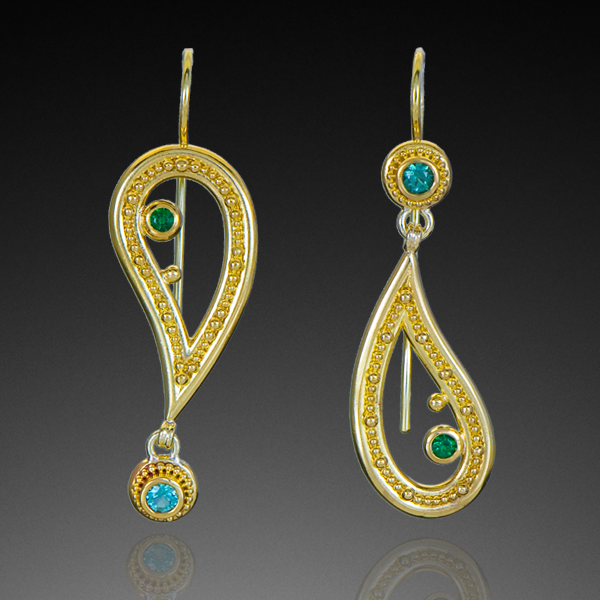 Hoops are in the Twist/Swirl style in oxidized sterling silver with 22kt yellow gold detail and 18kt yellow gold posts, 1 3/4″ total length. 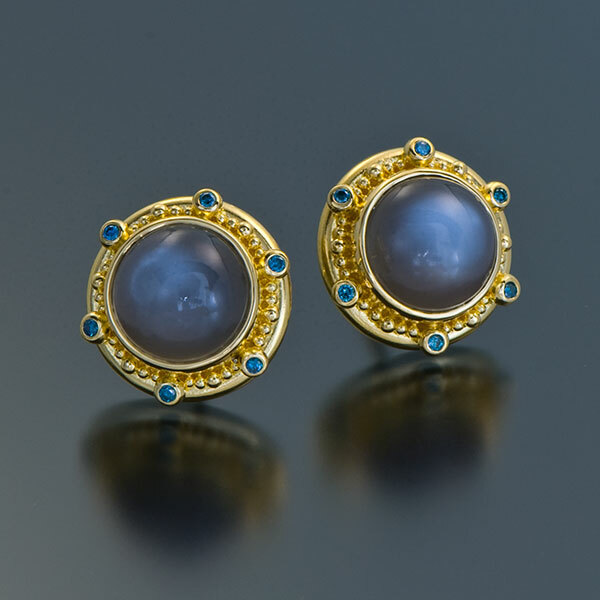 Earrings are set with Black Moonstones (10mm, 8.61tcw) and Blue Diamonds (.12tcw, R) set in granulated 22kt yellow gold with 18kt yellow gold posts, 5/8″ total diameter. 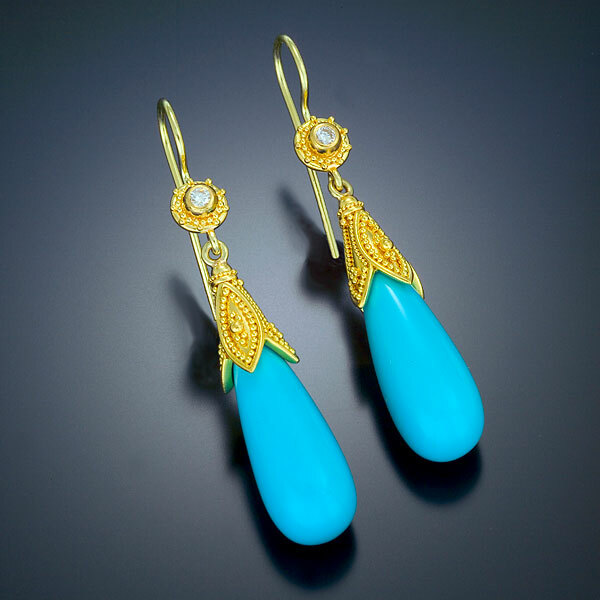 Ear plugs are set with Diamonds (1.01tcw) in granulated 22kt yellow gold with hammered, oxidized sterling silver and 18kt yellow gold hooks. 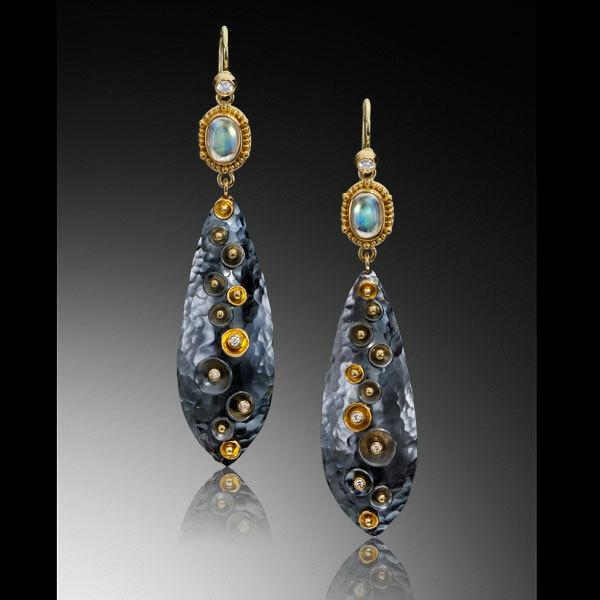 The removable drops are set with Diamonds (.23tcw) in 22kt yellow gold with hammered, oxidized sterling silver and 18kt yellow gold. 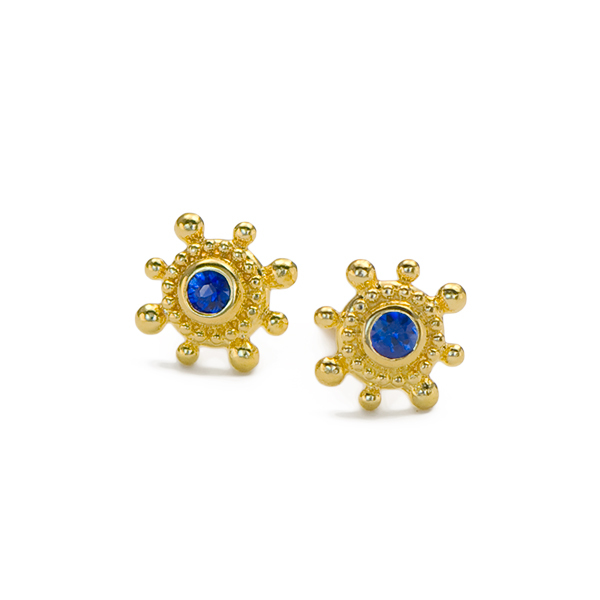 The plugs are 1/2″ in diameter & the total earring length is 2 1/8″. 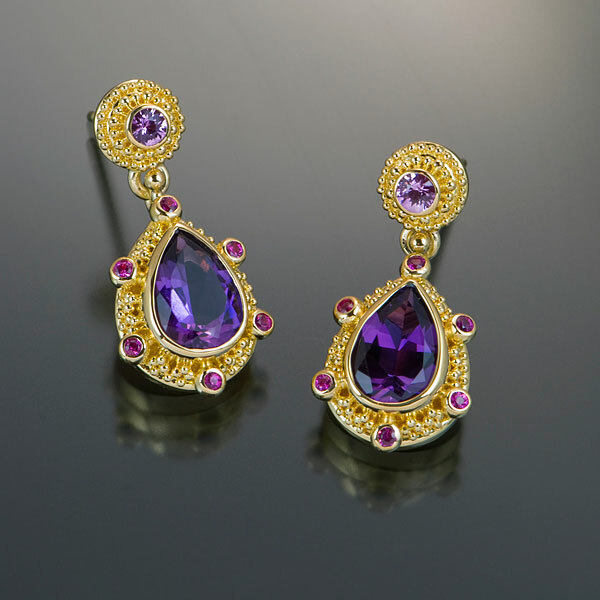 Earrings are set with Amethyst Briolettes (11.05cts, 15x10x6.5mm) and Teal Diamonds (.14tcw, R) in granulated 22kt yellow gold with 18kt yellow gold posts and clutch, 1.5″L x .375″W. 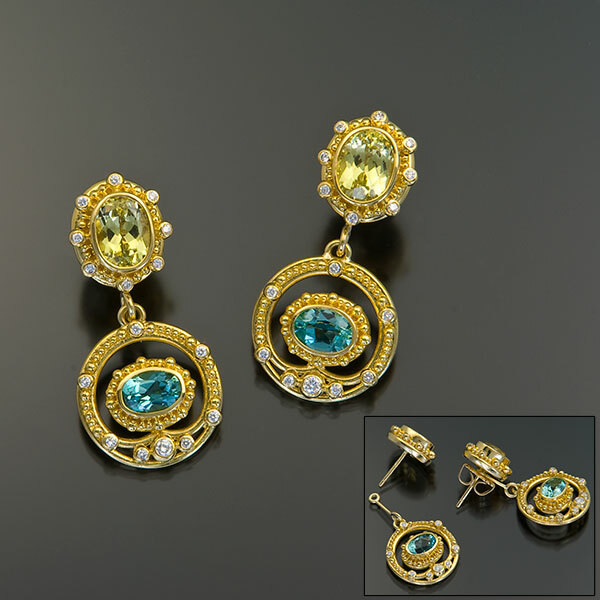 Mini button earrings are set with Mint Green Tourmalines (.14tcw) and Blue Diamonds (R, .06tcw) in granulated 22kt yellow gold with 18kt yellow gold posts, .375″ W x .5″ L.
Mini button earrings are set with Pink Spinels (.18tcw) and Diamonds (.06tcw) in granulated 22kt yellow gold with 18kt yellow gold posts, .375″ W x .5″ L.
These earrings have 8th Century C.E. 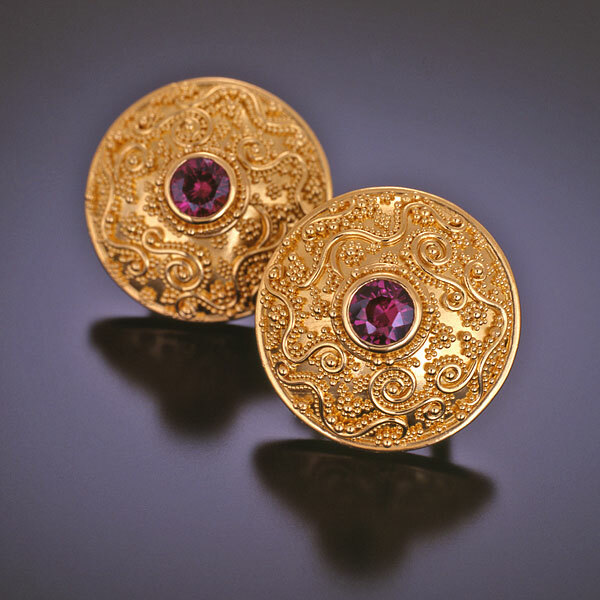 Saxon-Avar cast bronze belt placques with Red Spinels (.26tcw) set in granulated 22kt yellow gold with 18kt yellow gold french hooks. 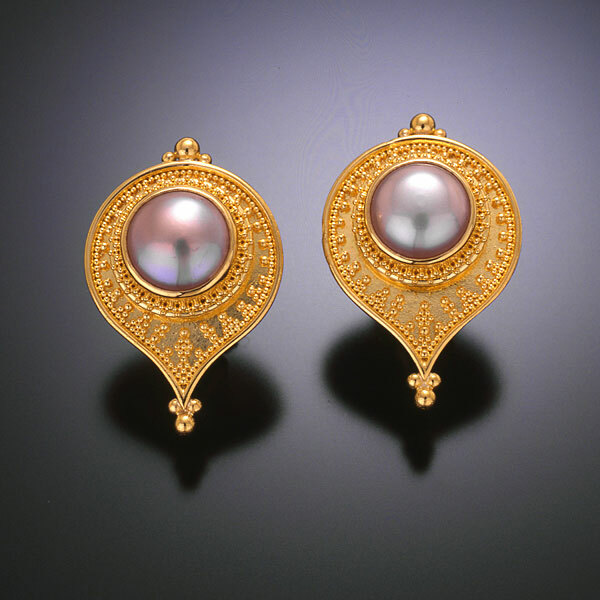 Domed earrings in granulated 22kt yellow gold with 18kt yellow gold posts, .375″ in diameter. 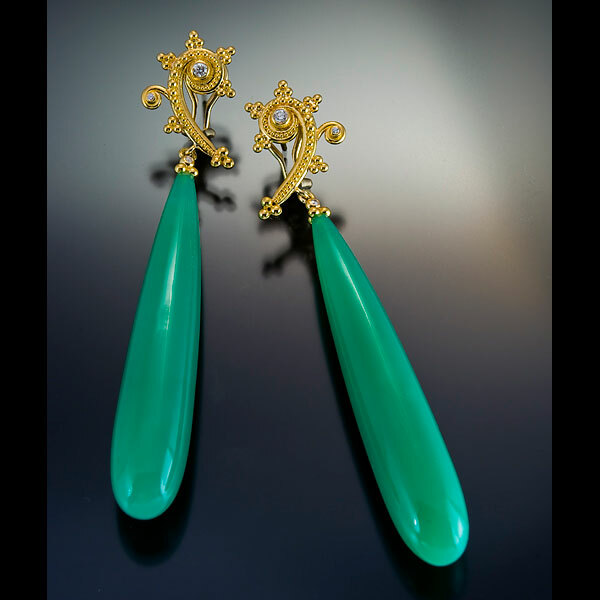 Earrings are set with carved Jade drops (36 x 10mm) in granulated 22kt yellow gold with 18kt yellow gold posts and omega clips. 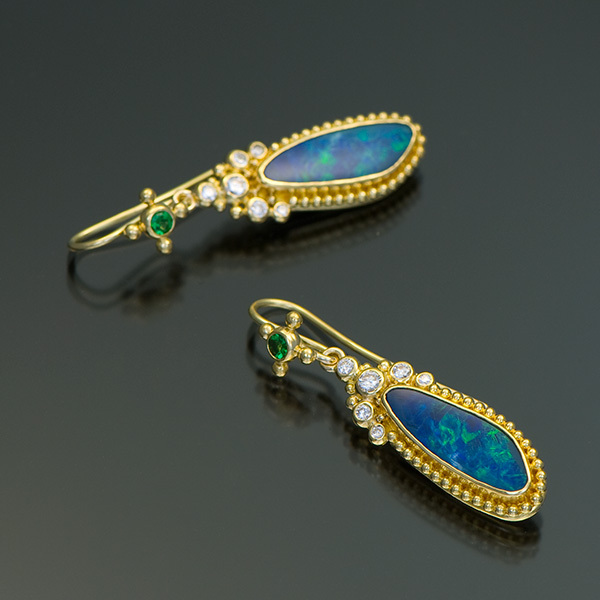 Earrings are set with Australian Yowah Boulder Opals (19.97tcw), Tsavorite Garnets (.57tcw) and Chrome Tourmalines (.24tcw) in granulated 22kt yellow gold with 18kt yellow gold french hooks, 1.5″ L x .875″ W x .25″ D.
Earrings are set with Moonstone briolettes (18x8mm, 14.20tcw) in granulated 22kt yellow gold with 18kt yellow gold posts. 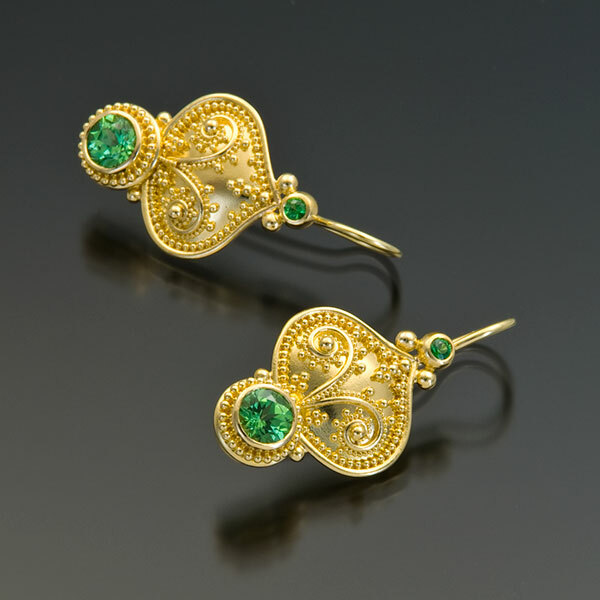 Earrings are set with Tsavorite Garnets (2@5.6mm, 1.61tcw; 2@2.5mm, .14tcw) in granulated 22kt yellow gold with 18kt yellow gold french hooks. 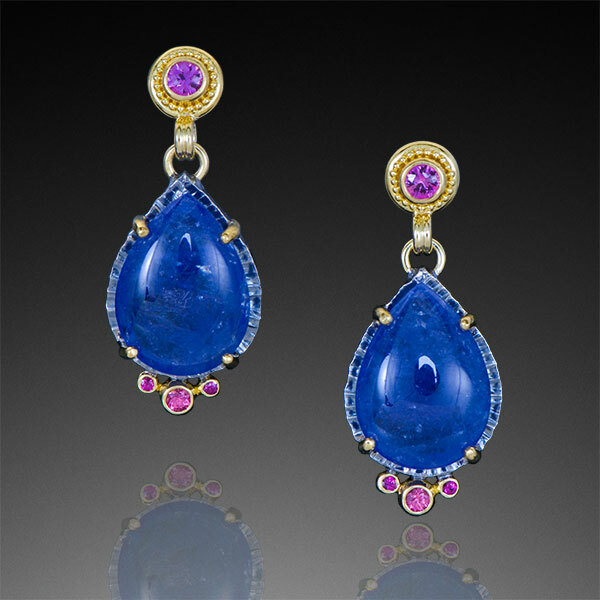 Drops are set with Tsavorite Garnets (1.76tcw), Blue Sapphires (.26tcw) and Pink Sapphires (.16tcw) in granulated 22kt yellow gold. 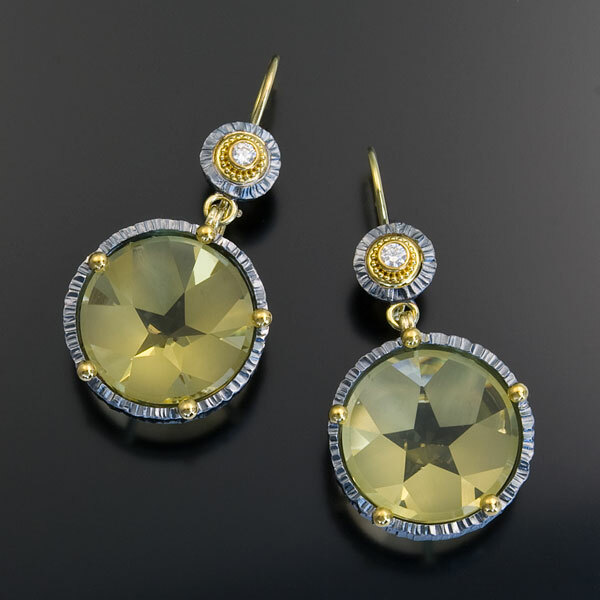 Earrings are set with fantasy star faceted Lemon Quartz (20mm, 42.50cts) and Diamonds (.22tcw) in granulated 22kt yellow gold and forged, oxidized sterling silver with 18kt yellow gold french hooks. 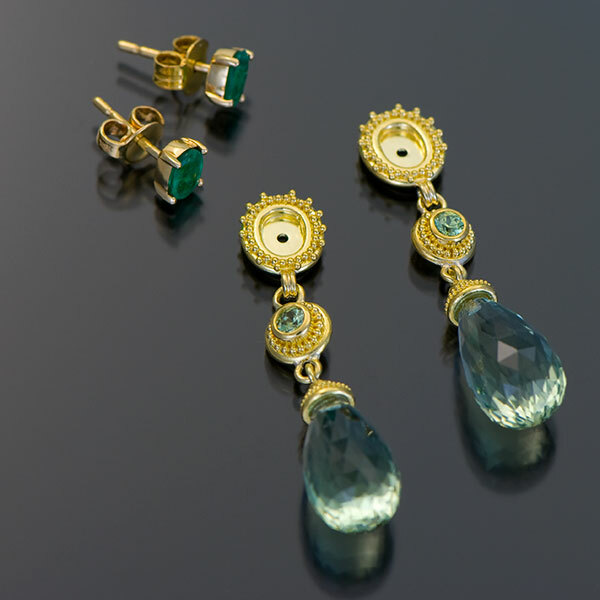 Earrings are set with Chrysoberyls (3.26tcw), Mint Green Tourmalines (1.82tcw) and Diamonds (.38tcw) in granulated 22kt yellow gold with 18kt yellow gold posts. 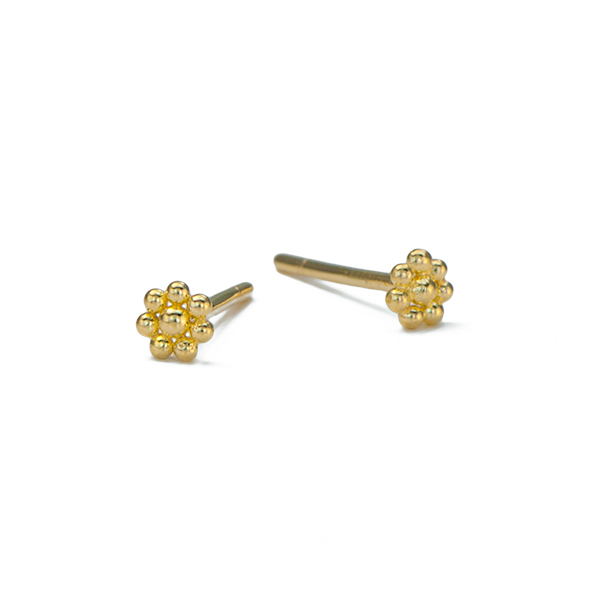 The Chrysoberyl element can be worn by itself as a stud earring or with the Tourmaline drops (see inset photo). 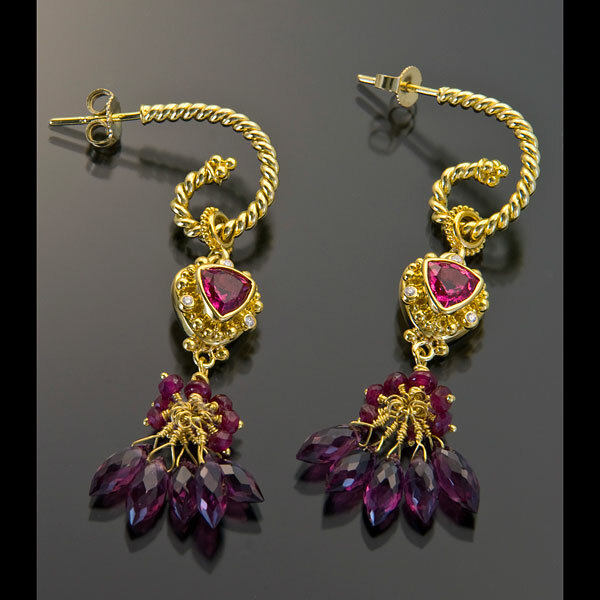 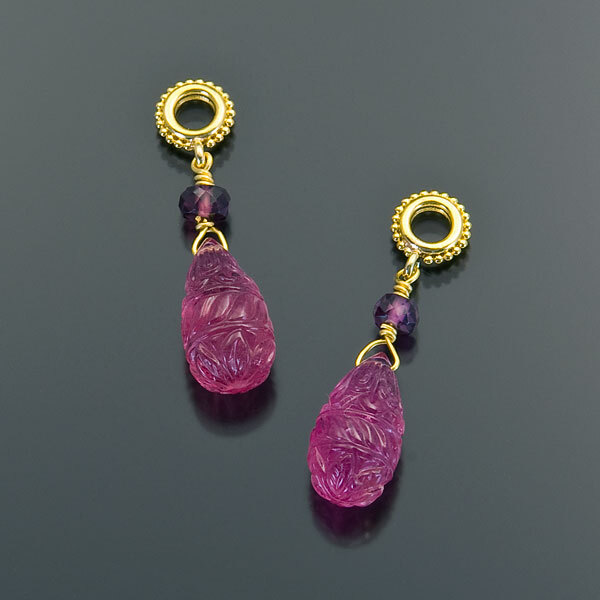 Drops are set with carved Pink Tourmaline briolettes and faceted Rhodolite Garnet beads in granulated 22kt yellow gold. 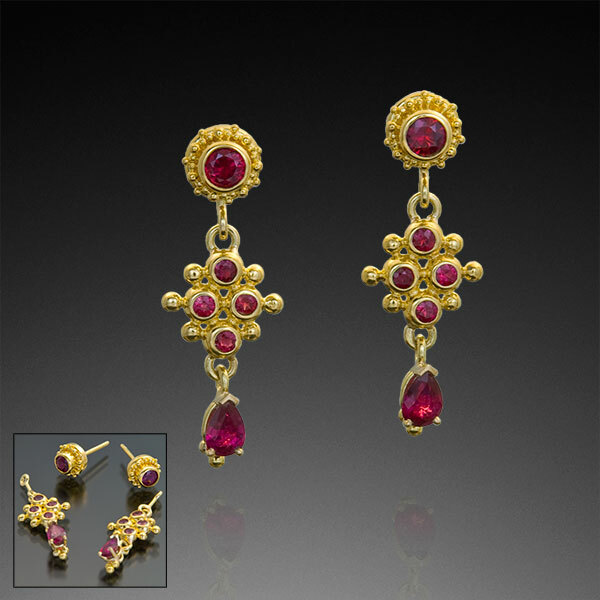 These earrings are set with Rubies (2.86tcw) set in granulated 22kt yellow gold with 18kt yellow gold posts. 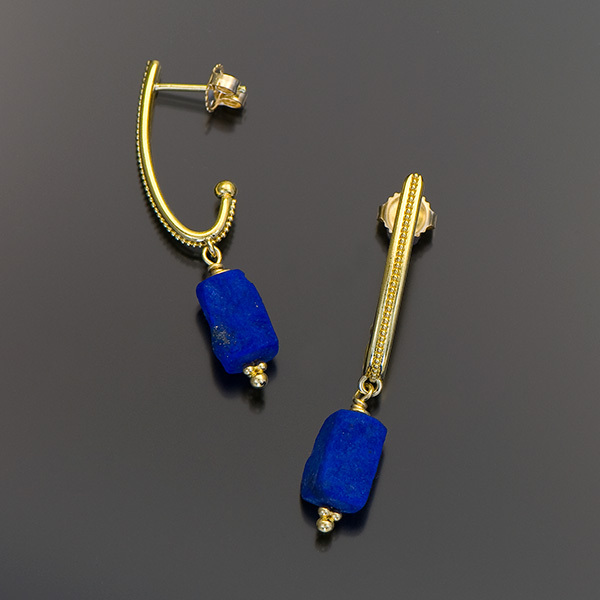 They consist of two parts: a stud earring and removable drops. 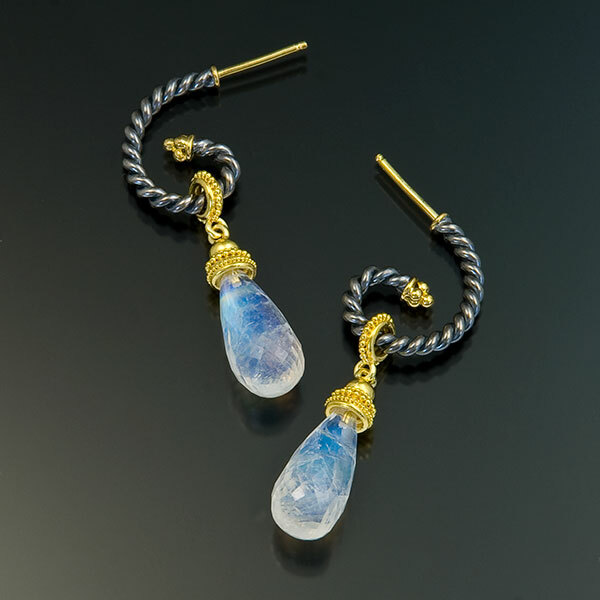 Earrings are set with Aquamarine Surface Crystal tiles (24.62tcw), Faceted Moonstones (1.06tcw) and Mint Green Tourmalines (.14tcw) in granulated 22kt yellow gold with 18kt yellow gold french hooks, 1.5″ L x 5/8″ W x 3/8″ D.
Earrings are set with Moonstones (5x7mm, 1.45tcw) and Diamonds (.23tcw) in granulated 22kt yellow gold with forged and oxidized sterling silver and 18kt yellow gold french hooks, 2.5″ L x 5/8″ W x 1.4″ D.
Golden South Seas Pearls (10.2mm) set in granulated 22kt yellow gold removable drops for hoop earrings. 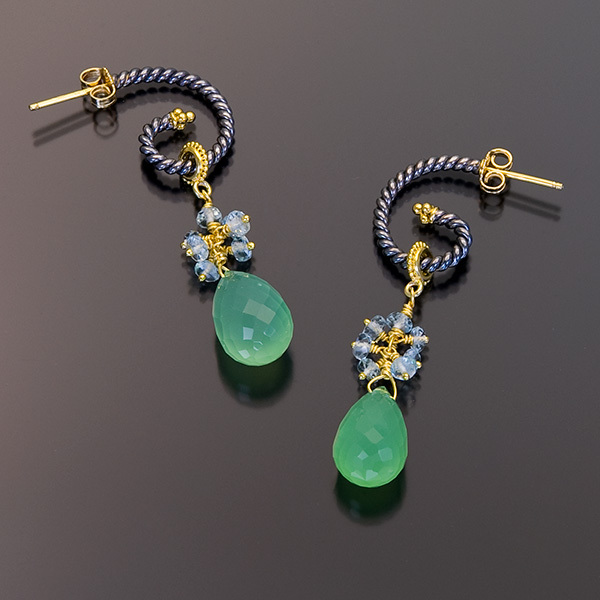 Earrings are set with Blue Sapphires (.24tcw) in granulated 22kt yellow gold with faceted Emerald beads, Labradorite briolettes and 18kt yellow gold posts, 2″L x .25″W. 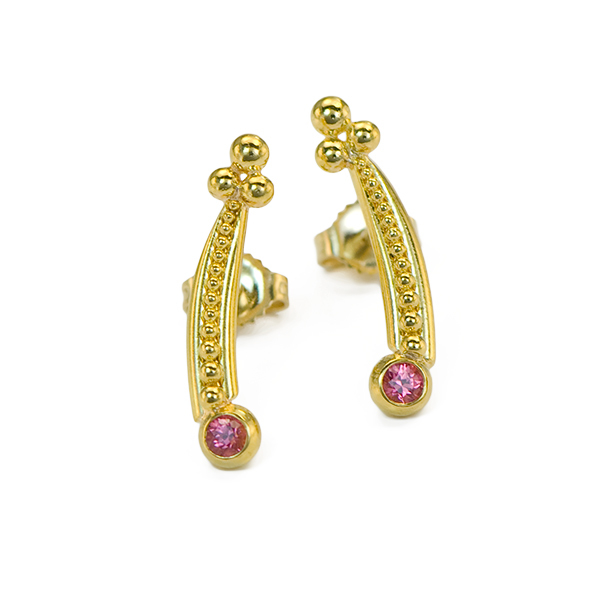 Ear cuff in granulated 22kt yellow gold with 18kt yellow gold back structure. 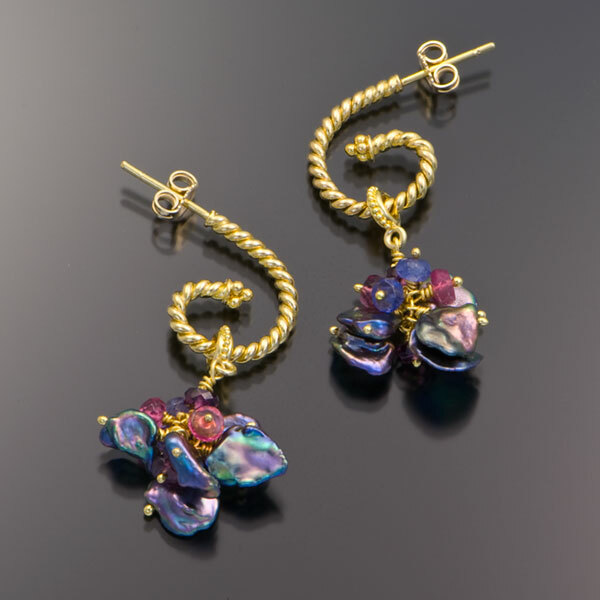 This is a pair of ear cuffs that looks like three separate hoop earrings when on the ear. 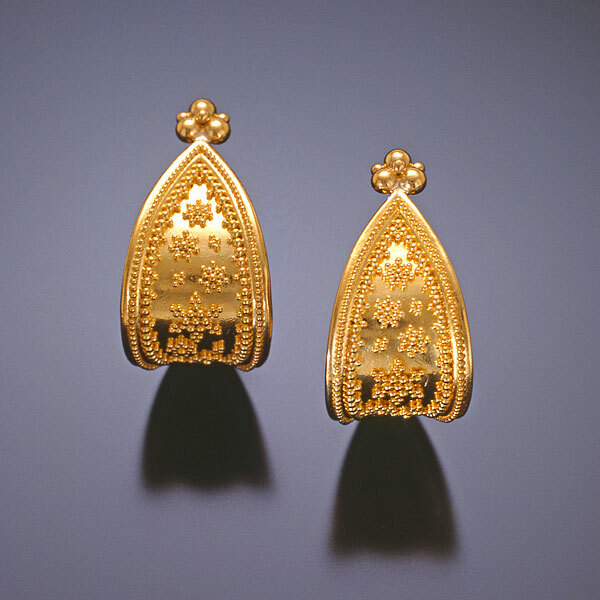 They can be worn by themselves, but the cuff was designed to be worn with earrings. 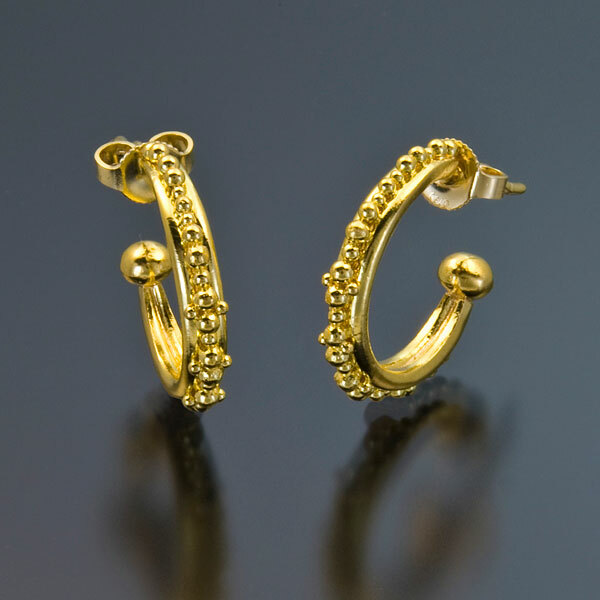 The earring post or french hook feeds through the small loop in front of the hoop set after passing through the piercing hole- this stabilizes the cuff in the front. 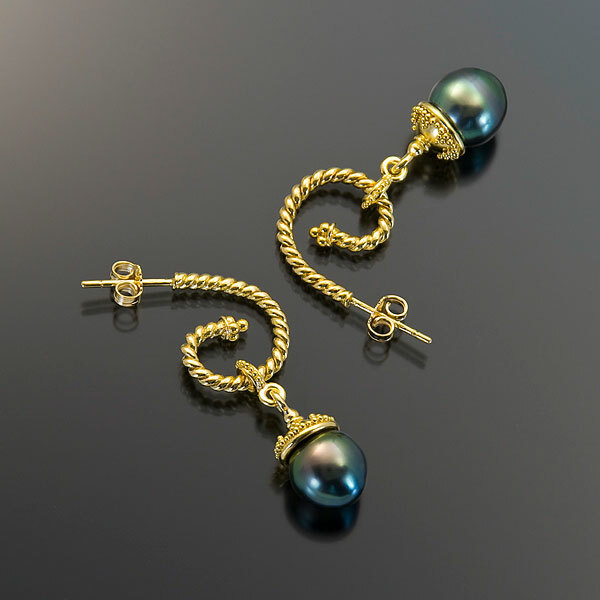 The large hook at the back loops over the ear itself. 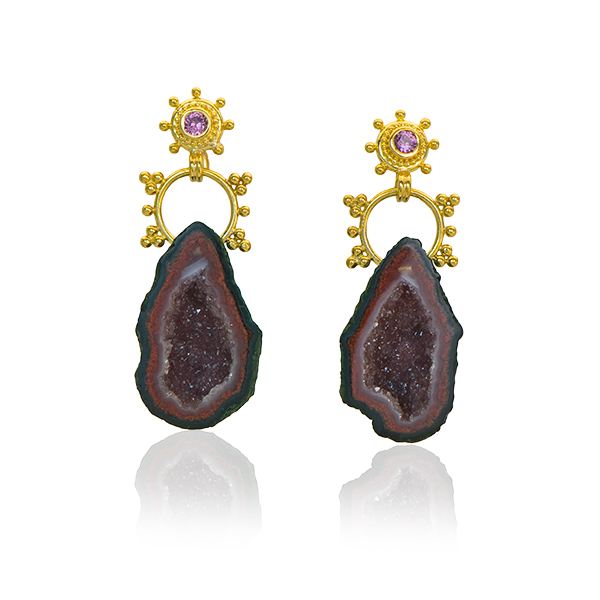 Rubellite Pink Tourmalines (1.52 tcw) and Diamonds (.07 tcw) set in granulated 22kt yellow gold on elongated partial hoops in granulated 22kt yellow gold with 18kt yellow gold posts. 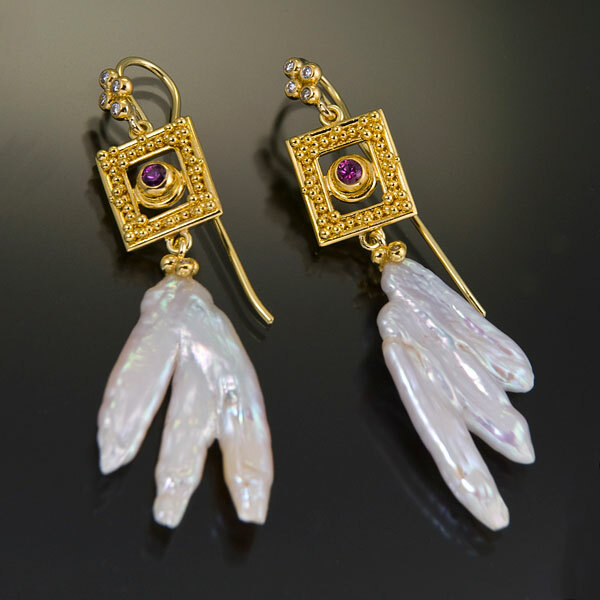 Earrings are set with Magenta Sapphires, Diamonds and White Freshwater Wing Pearls in granulated 22kt yellow gold with 18kt yellow gold french hooks. 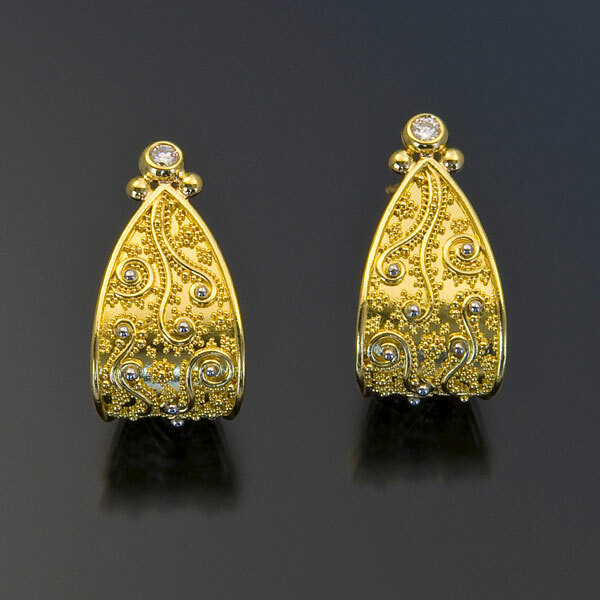 Earrings in granulated 22kt yellow gold with 18kt yellow gold french hooks. 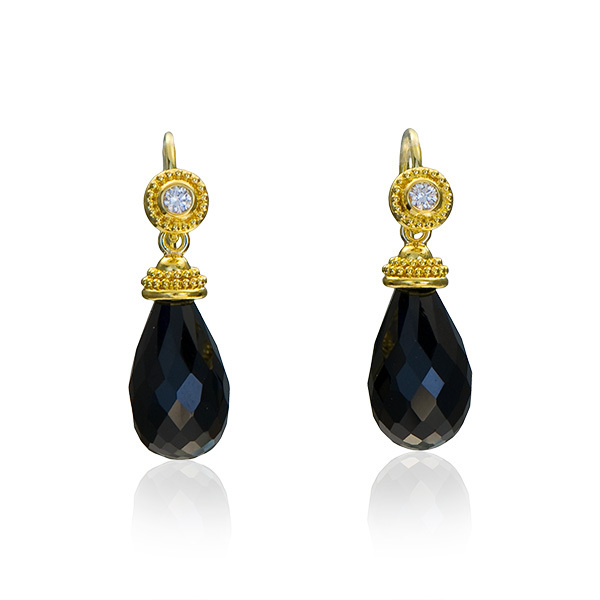 Earrings are set with Diamonds in granulated 22kt yellow gold with 18kt yellow gold french hooks. 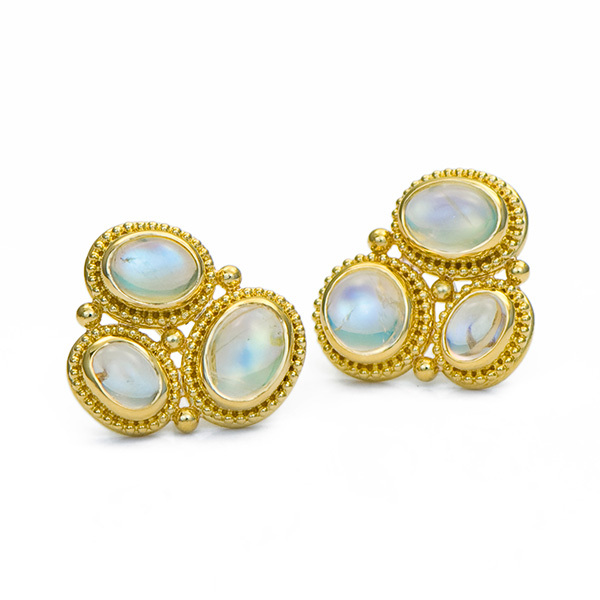 Hoop Earrings are in the Twist/Swirl style in 18kt yellow gold with 22kt yellow gold detail. 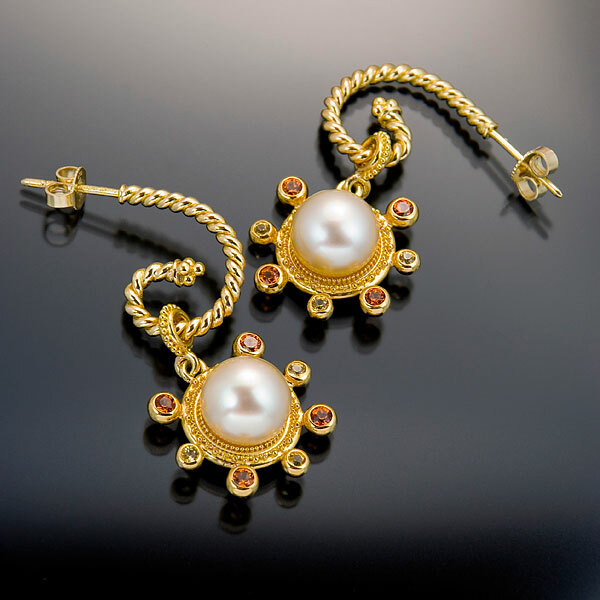 Drops are set with Golden South Seas button Pearls, Mandarin Garnets and Yellow Sapphires in granulated 22kt yellow gold. 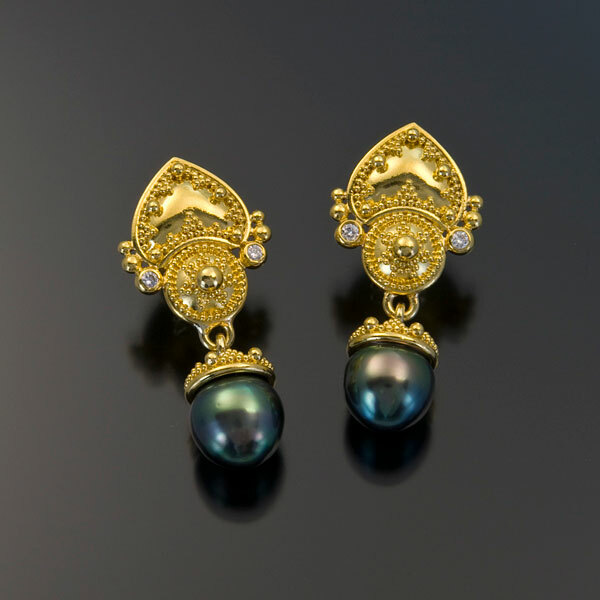 Earrings are set with Black Tahitian Pearls, White South Seas Pearls and Diamonds in granulated 22kt yellow gold with 18kt yellow gold french hooks. 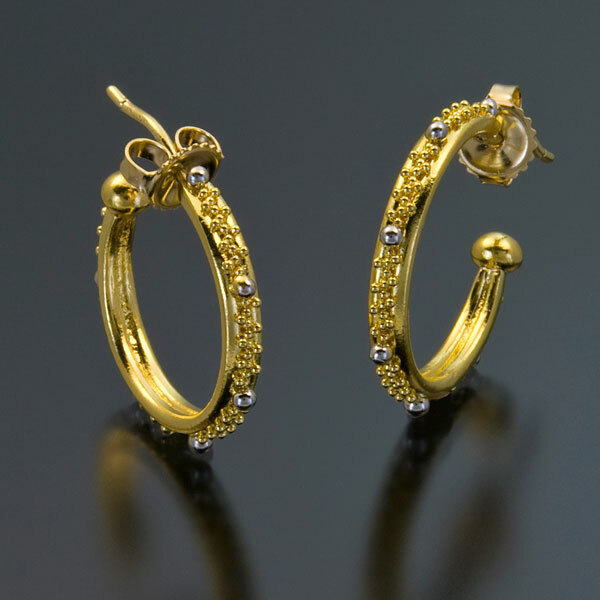 Flared Hoop style Earrings in granulated 22kt yellow gold with 18kt yellow gold posts. 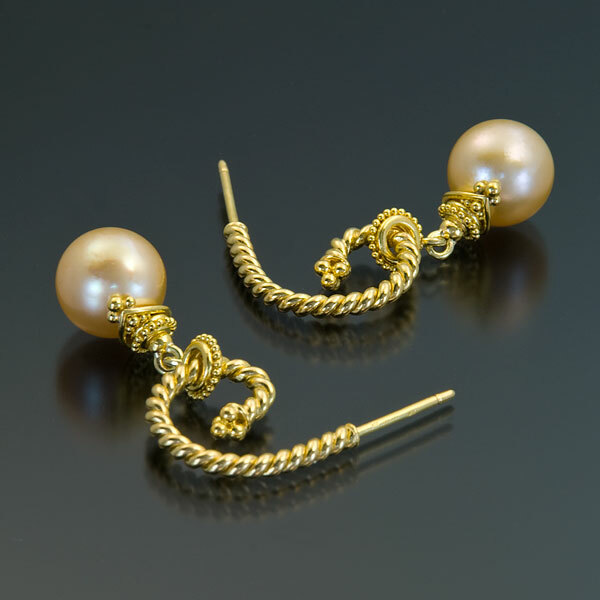 Earrings are set with Violet Freshwate Button Pearls in granulated 22kt yellow gold with 18kt yellow gold post and omega clips. 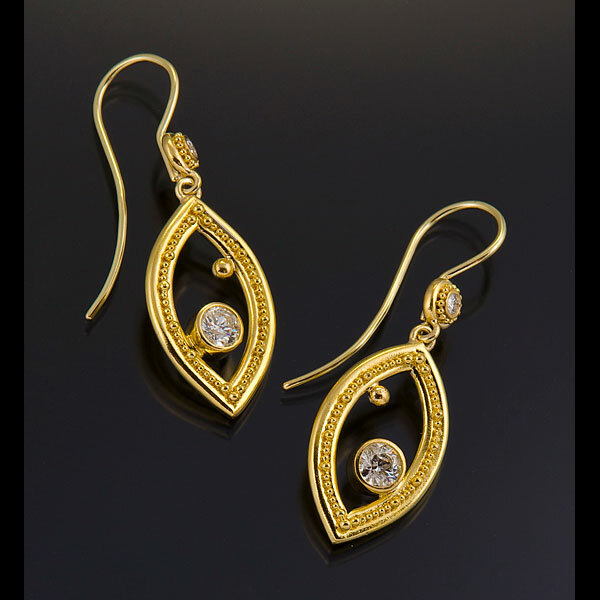 Hoop Earrings are in the Twist/Swirl style in 18kt yellow gold with 22kt yellow gold detail. 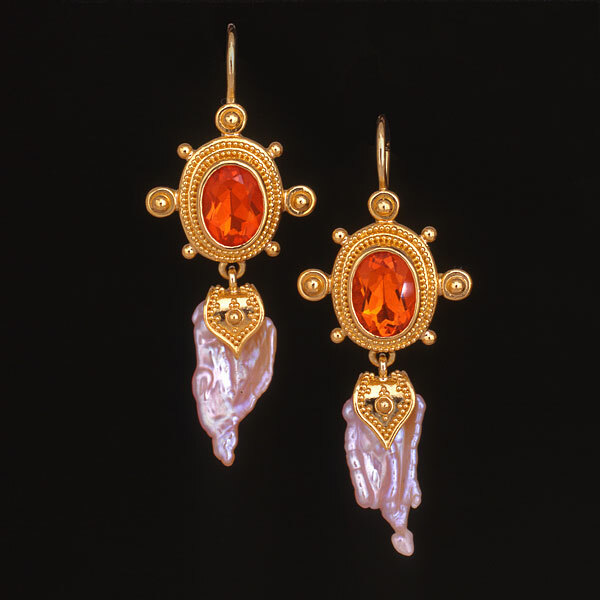 Drops are set with Oregon Sunstone briolettes in granulated 22kt yellow gold. 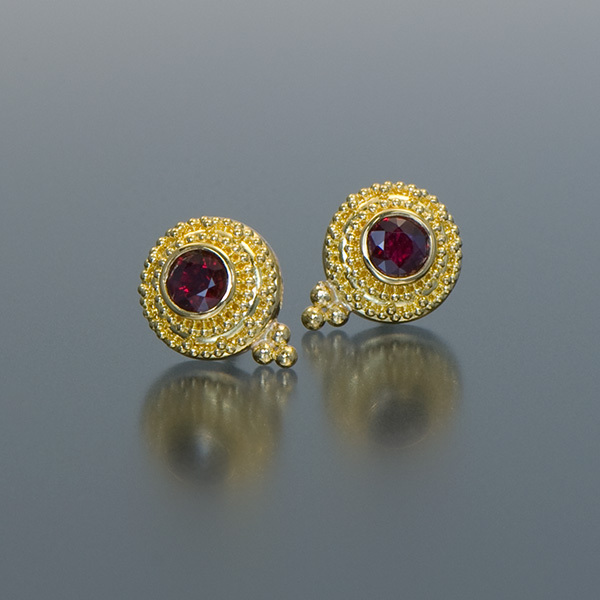 Earrings are set with Spessartite Garnet briolettes in granulated 22kt yellow gold with 18kt yellow gold post and omega clips. 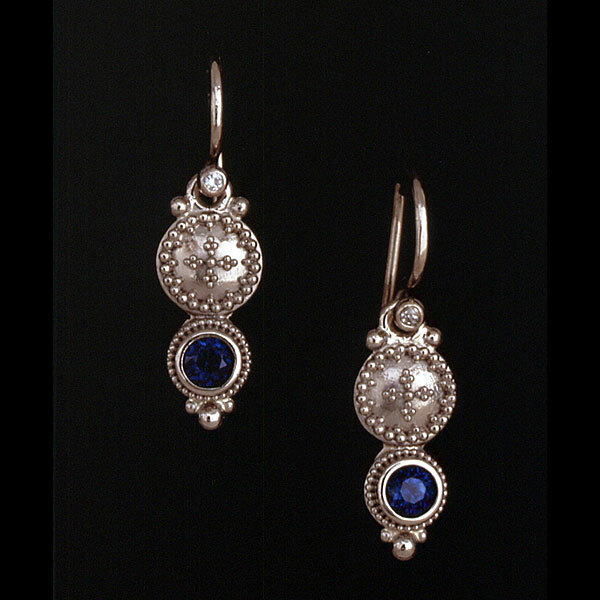 Earrings are set with Blue Sapphires and Diamonds in granulated 22kt white gold. 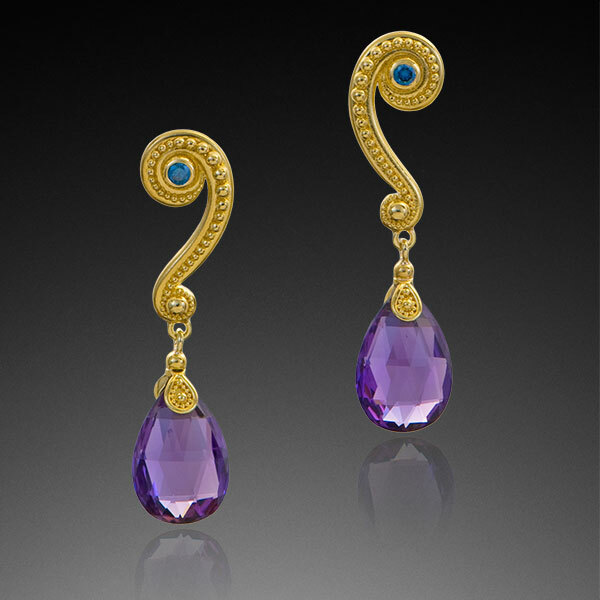 Earrings are set with Purple Sapphires and Rubellite Tourmalines in 22kt yellow gold with Platinum granulation and 18kt yellow gold french hooks. 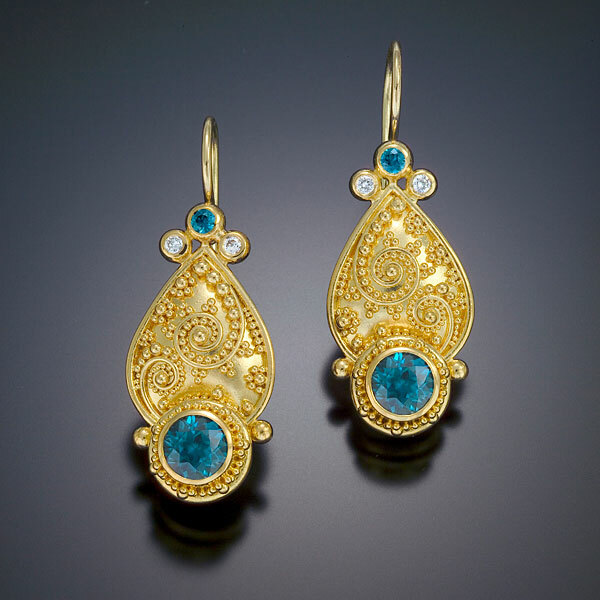 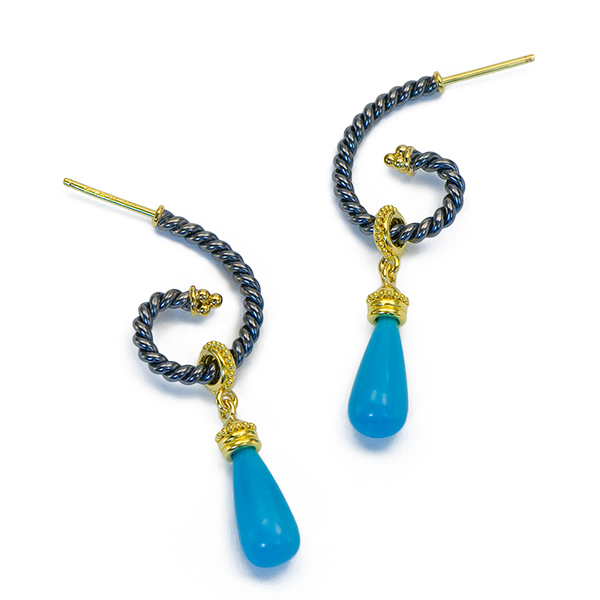 Earrings are set with Persian Turquoise and Diamonds in granulated 22kt yellow gold with 18kt yellow gold french hooks. 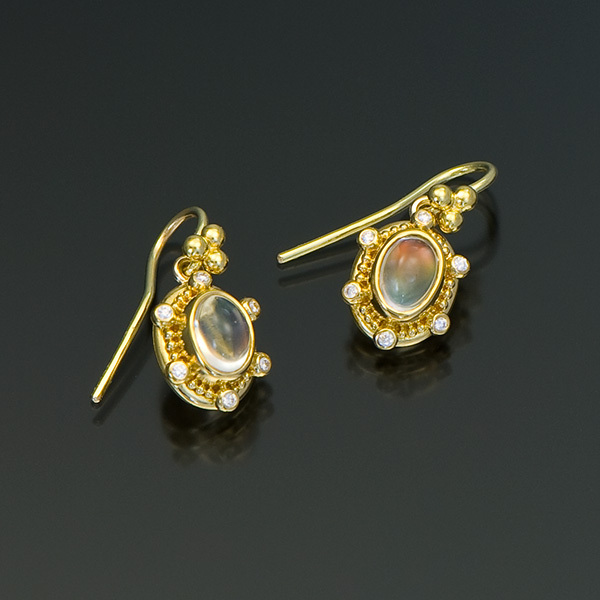 Earrings are set with Moonstones in granulated 22kt yellow gold with 18kt yellow gold french hooks. 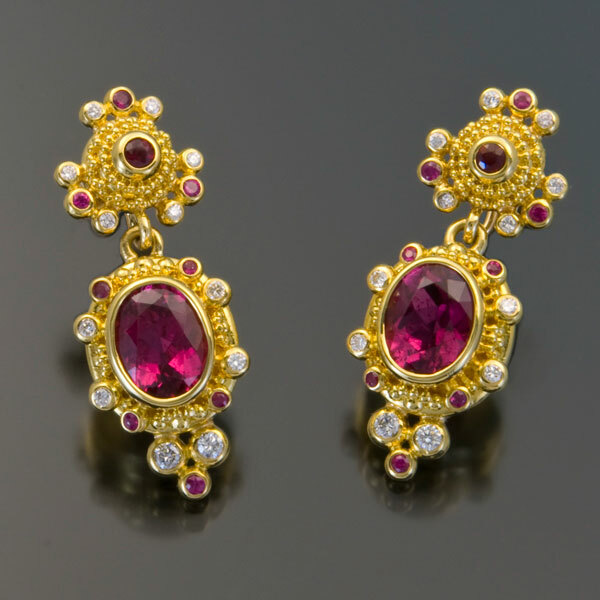 Earrings are set with Grape Garnets in granulated 22kt yellow gold with 18kt yellow gold post and omega clips. 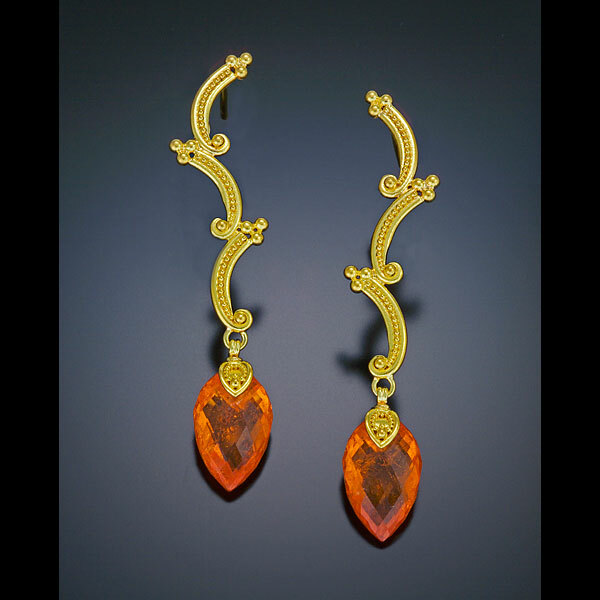 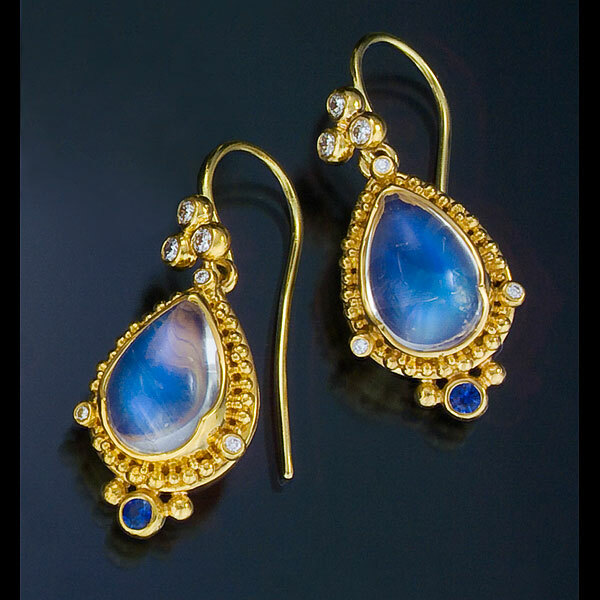 Earrings are set with Mexican Fire Opals and Diamonds in granulated 22kt yellow gold with 18kt yellow gold french hooks. 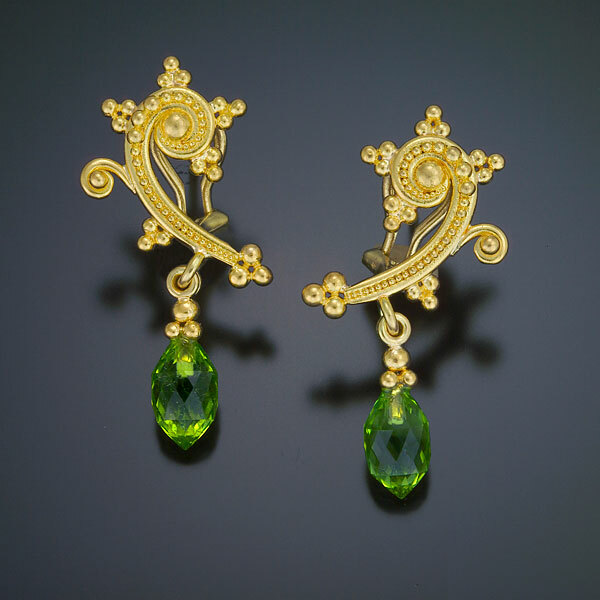 Earrings are set with Peridot briolettes in granulated 22kt yellow gold with 18kt yellow gold post and omega clip. 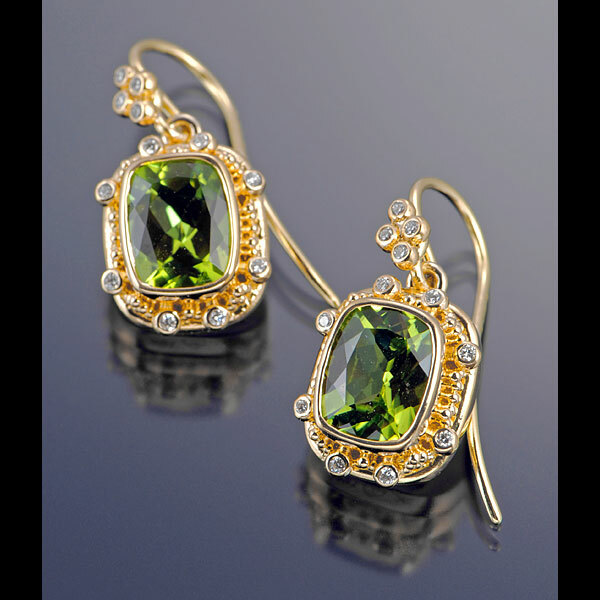 Earrings are set with Peridot and Diamonds in granulated 22kt yellow gold with 18kt yellow gold french hooks. 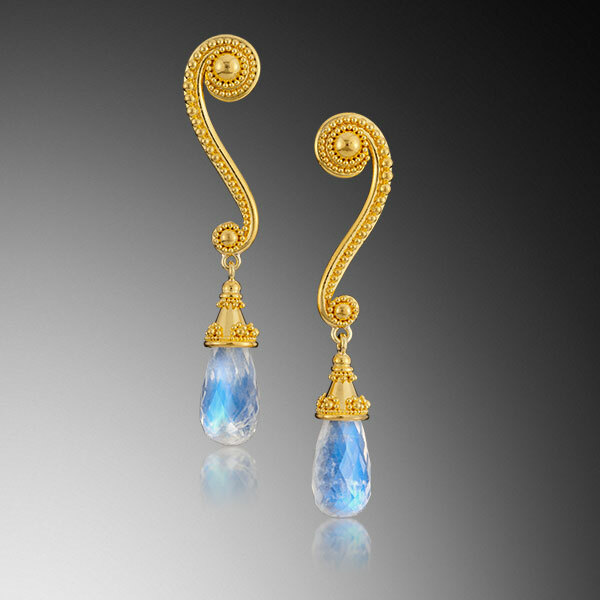 Earrings are set with Blue Zircons and Diamonds in granulated 22kt yellow gold with 18kt yellow gold french hooks. 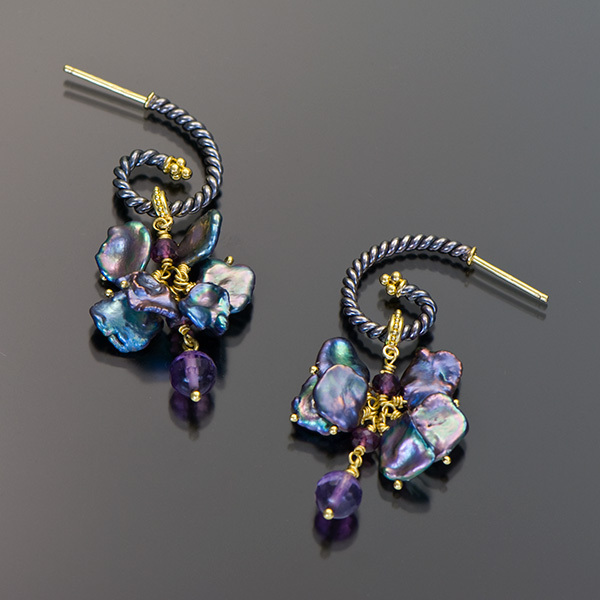 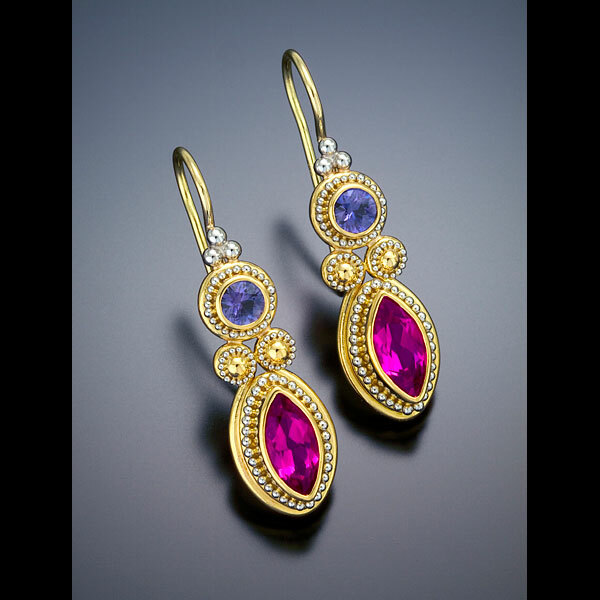 Earrings are set with Amethysts, Violet Sapphires and Hot Pink Sapphires in granulated 22kt yellow gold with 18kt yellow gold french hooks. 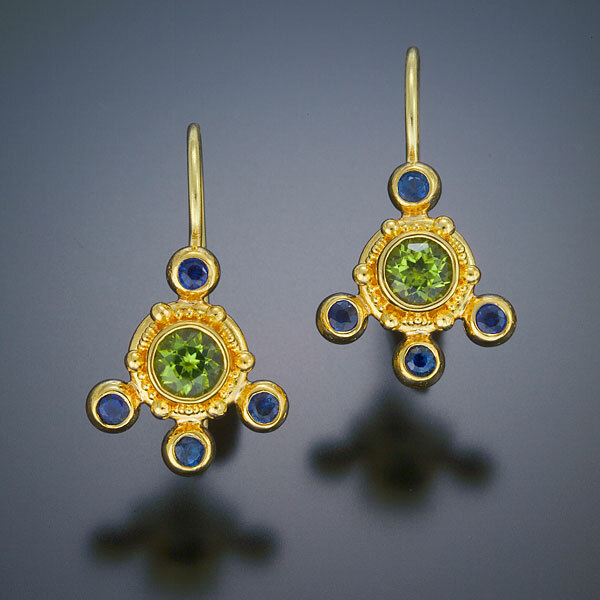 Earrings are set with Peridot and Blue Sapphires in granulated 22kt yellow gold with 18kt yellow gold french hooks. 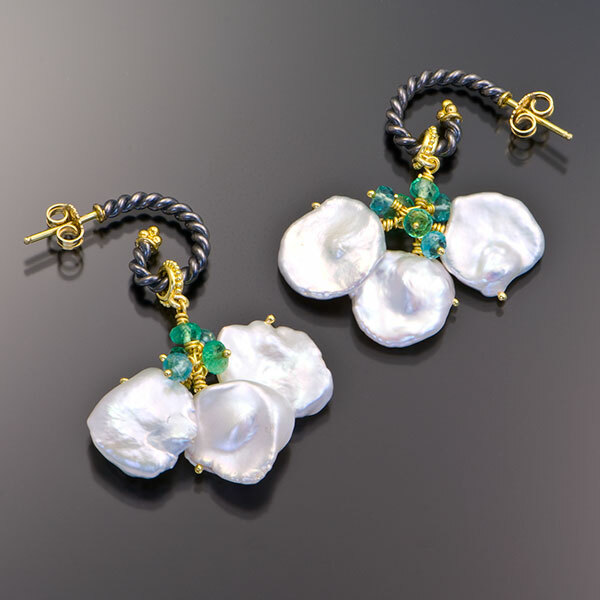 Earrings are set with Mexican Fire Opals and White Freshwater Keshi Pearls in granulated 22kt yellow gold with 18kt yellow gold french hooks. 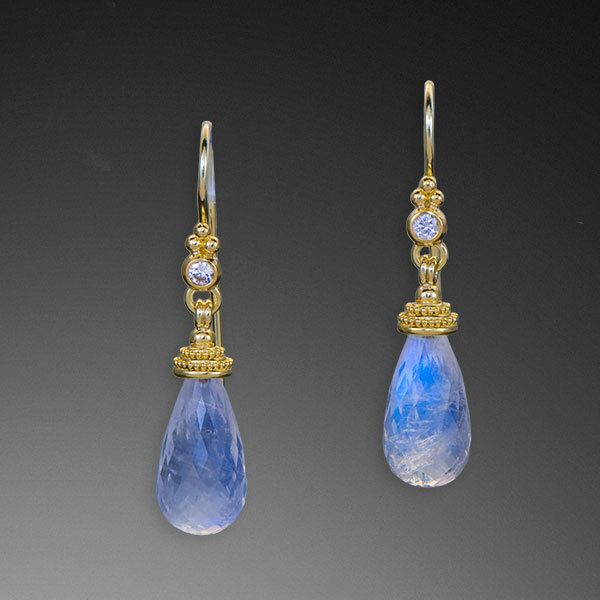 Earrings are set with Blue Moonstones, Sapphires and Diamonds in granulated 22kt yellow gold with 18kt yellow gold french hooks. 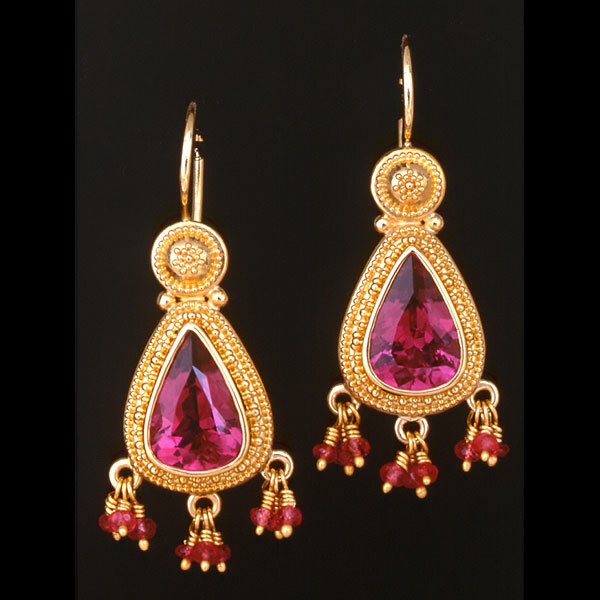 Earrings are set with Rubellite Tourmalines in granulated 22kt yellow gold with Ruby bead fringe and 18kt yellow gold french hooks. 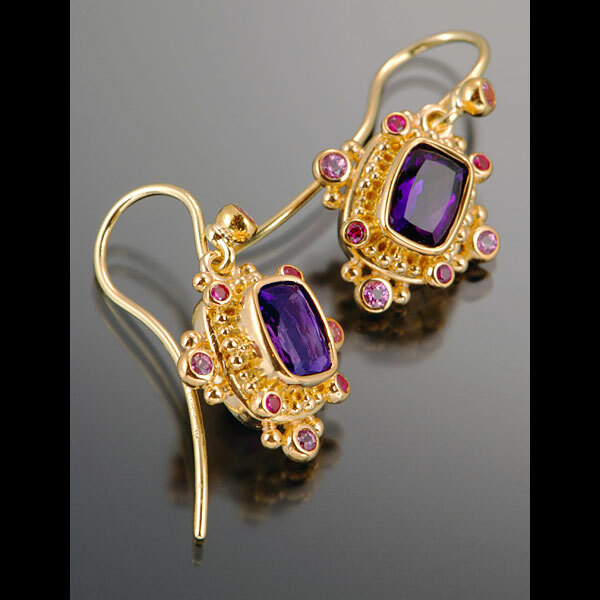 Earrings are set with Amethysts, Purple Sapphires and Hot Pink Sapphires in granulated 22kt yellow gold with 18kt yellow gold posts. 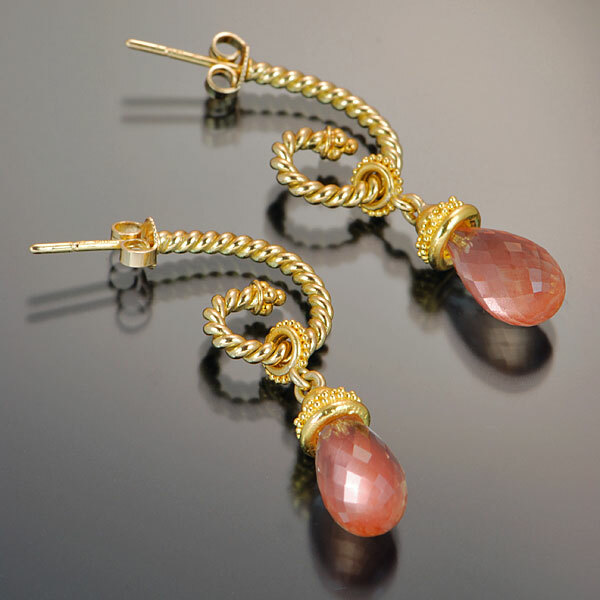 Hoop Earrings are in the Twist/Swirl style in 18kt yellow gold with 22kt yelllow gold detail. 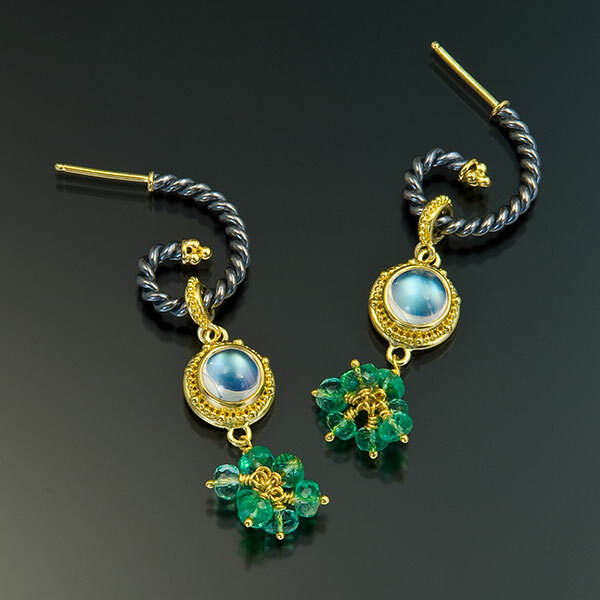 Drops have Emerald beads and White Freshwater Coin Pearls in granulated 22kt yellow gold. 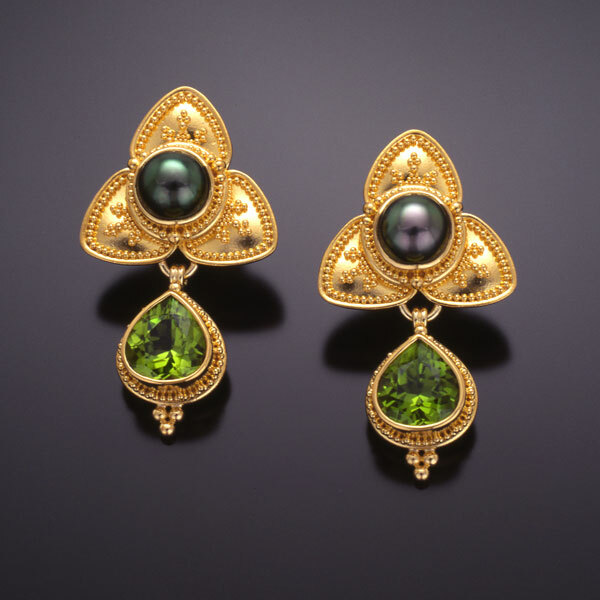 Earrings are set with Peridot and Black Tahitian Pearls in granulated 22kt yellow gold with 18kt yellow gold post and omega clips. 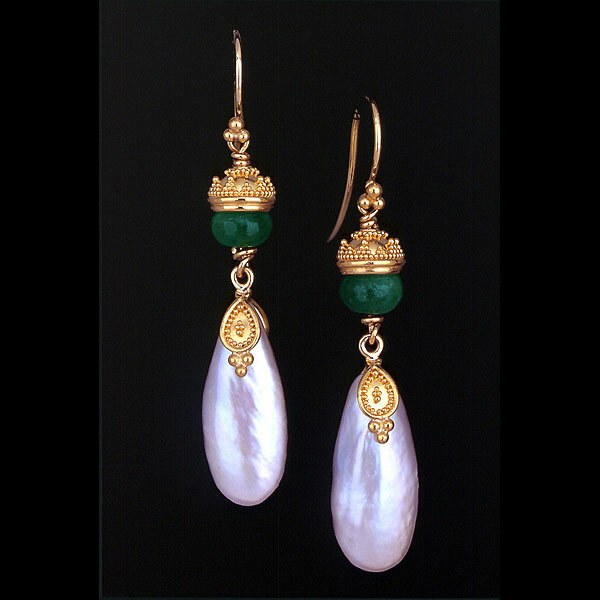 Earrings are set with Emerald beads and Tennessee River Pearls in granulated 22kt yellow gold with 18kt yellow gold french hooks. 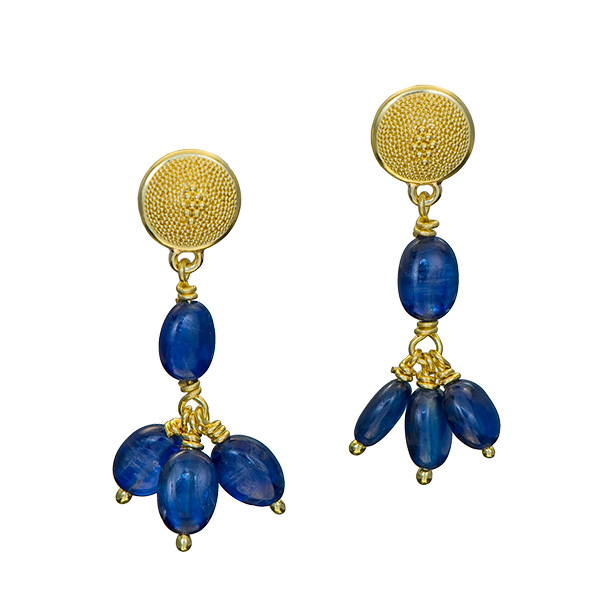 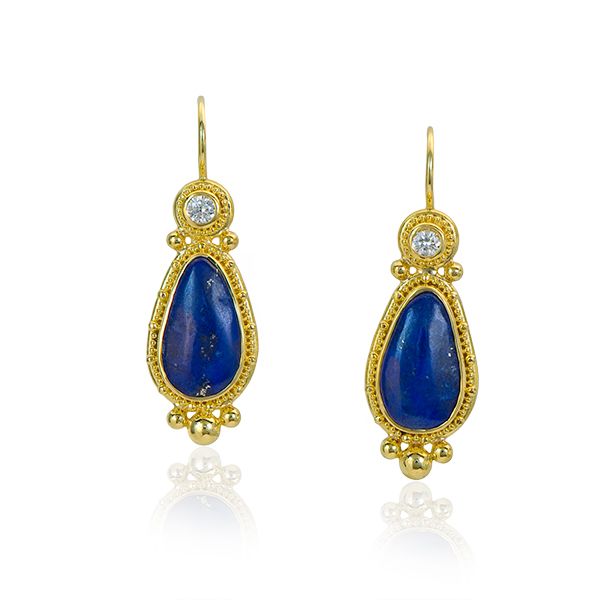 Earrings are set with Blue Sapphires in granulated 22kt yellow gold with 18kt yellow gold french hooks. 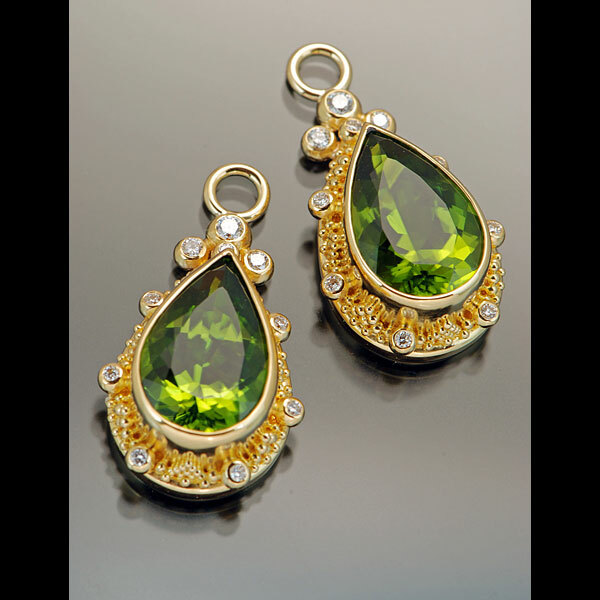 Drops for Hoop Earrings are set with Peridot and Diamonds in granulated 22kt yellow gold with 18kt yellow gold. 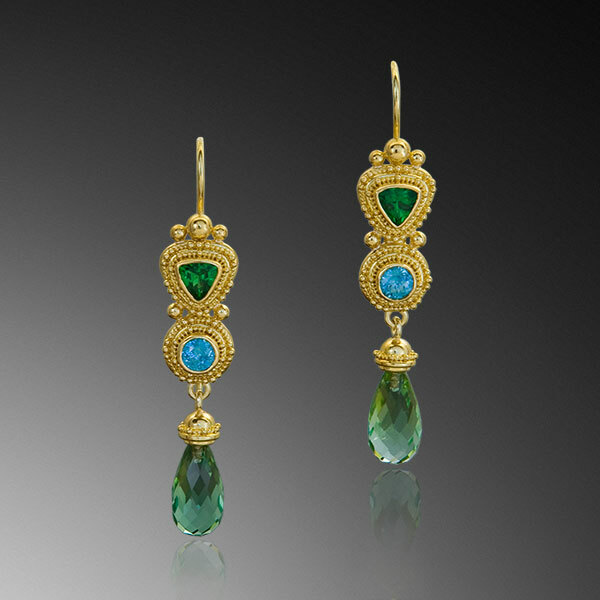 Earrings are set with Chrome Tourmalines, Aquamarines and Diamonds with removeable Green Tourmaline drops in granulated 22kt yellow gold with 18kt yellow gold posts. 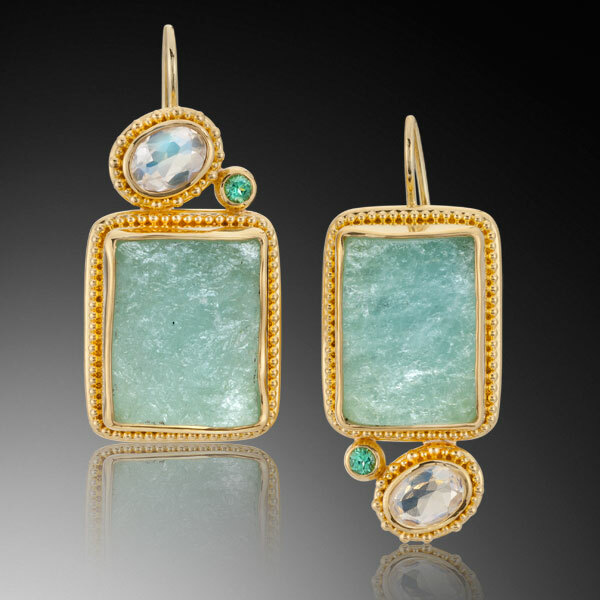 Earrings are set with Chrysoprase drops and Diamonds in granulated 22kt yellow gold with 18kt yellow gold posts and omega clips. 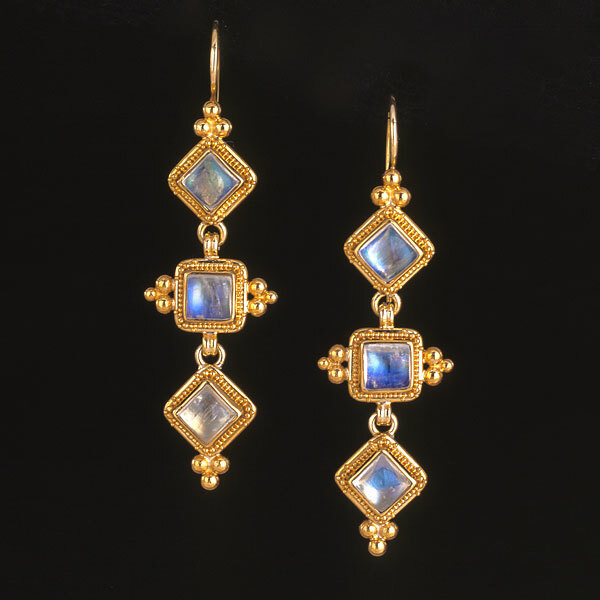 Earrings are set with Rainbow Moonstones (6.89tcw) and Diamonds (.50tcw) in granulated 22kt yellow gold with 18k yellow gold french hooks, 1.25″ L x .5″ W.
Earrings are set with Pink and Purple Sapphires (.50tcw) and Diamonds (.31tcw) in granulated 22kt yellow gold with 18kt yellow gold posts, 1.5″L x .75″W x .25″D. 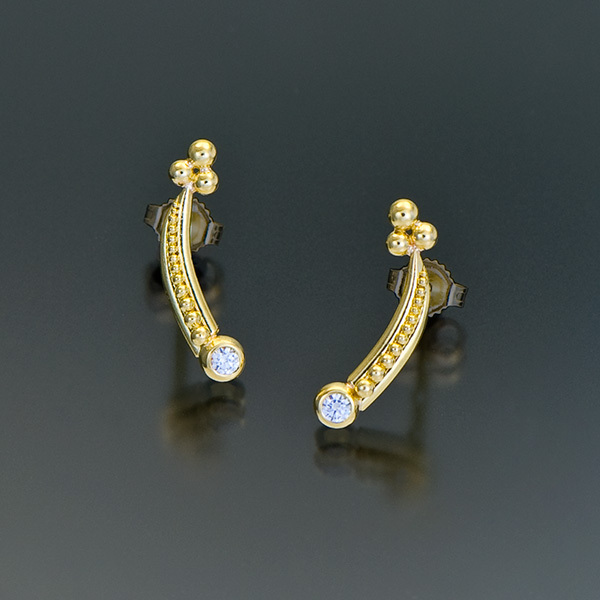 22kt yellow gold hoop earrings with 22kt yellow gold granulation and 18kt yellow gold posts. 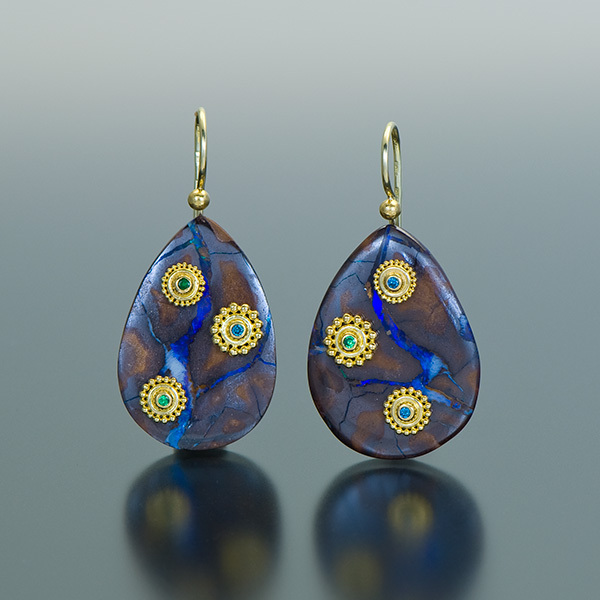 .625″ in diameter. 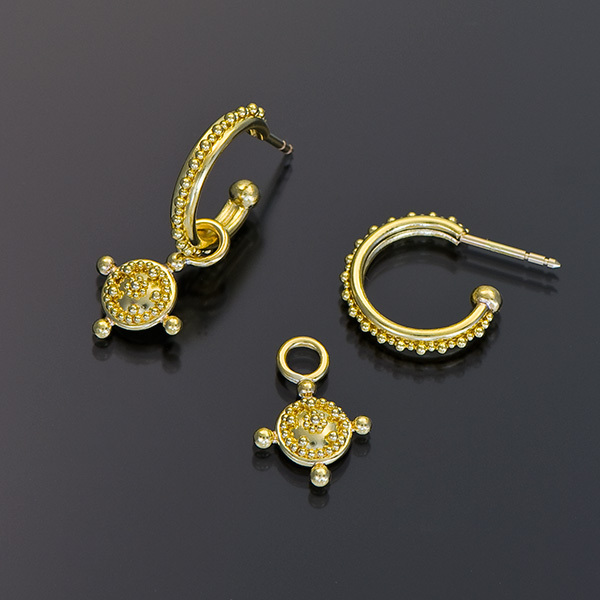 Fine silver hoop earrings with 22kt yellow gold granulation and 18kt yellow gold posts. 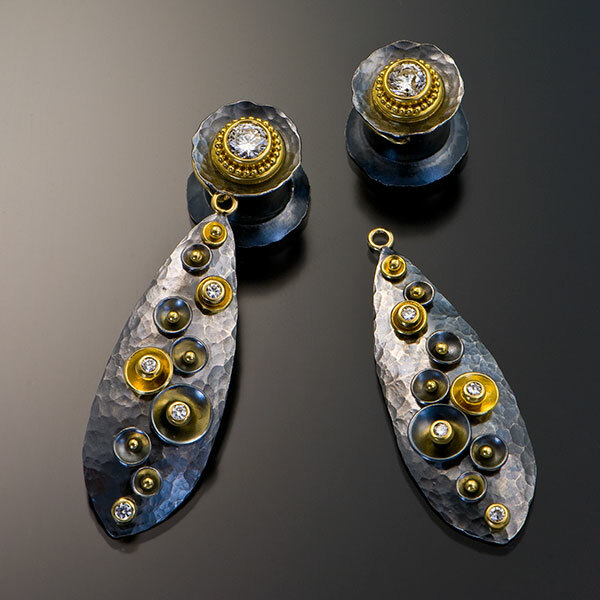 .625″ in diameter. 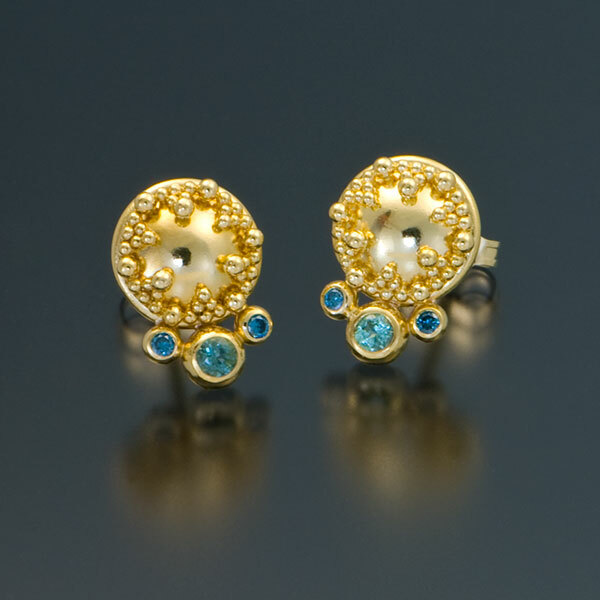 Fine silver hoop earrings with 22kt yellow gold granulation and 18kt yellow gold posts. 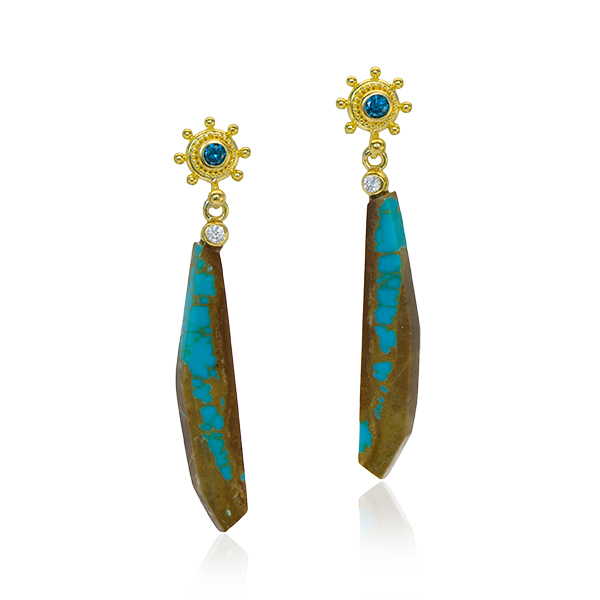 .875″ in diameter. 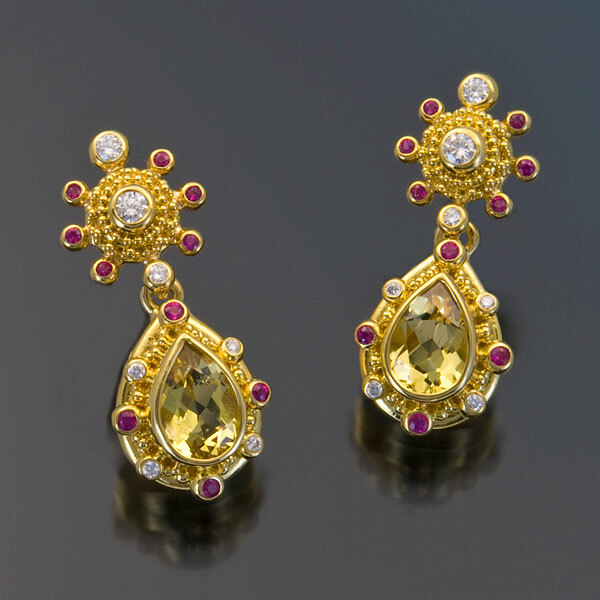 Earrings are set with Diamonds (.12tcw) in 22kt yellow gold with Platinum and 22kt yellow gold granulation and 18kt yellow gold posts.